When we are talking about body art and especially tattoos, we almost always tend to think about men. As a matter of fact, tattoos have been men’s symbol of societal influence and status for about two millennia. 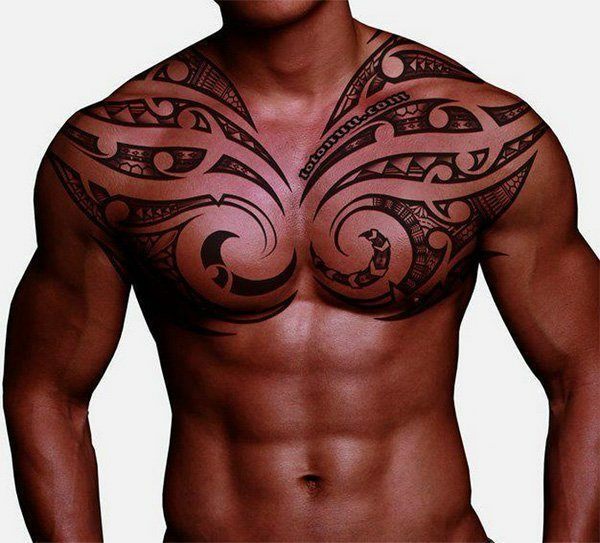 From the various tribal groups of the islands of Polynesia, tribal confederacies of the Americas, to the well-established kingdoms and empires of Europe, no one can simply deny the fact of how tattoo ideas on men have affected civilization, and in extension, men’s psyche. In this article, we will be talking about various things regarding tattoos on men. 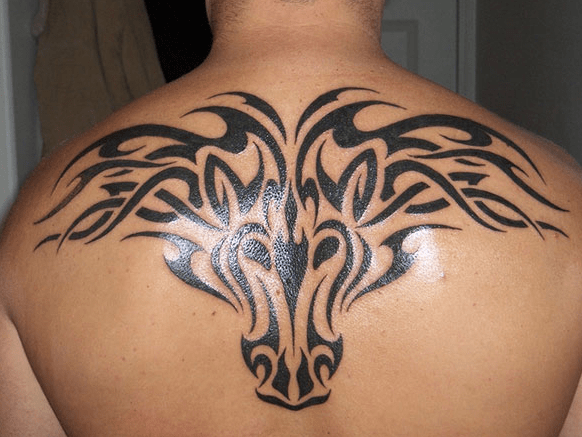 We will be sharing with you a lot of tattoo ideas for men that will be perfect for your masculine aura like the tattoos designs you may want to get and what to avoid. So just sit back and relax while we take control of the situation and present to you various tattoo ideas on men. 2 What Are The Most Popular Tattoo Ideas For Men? 4 What Sort of Tattoos Should Men Avoid? 5 Where Should I Place My Tattoo? Men and tattoos have this intertwined place in history. For one, tattoos were, and in some places, are still a status symbol of a man’s societal influence and status. It has just been recent when men consider tattoos as an art form and a way to physically and artistically express their personality, emotions, and ideas. 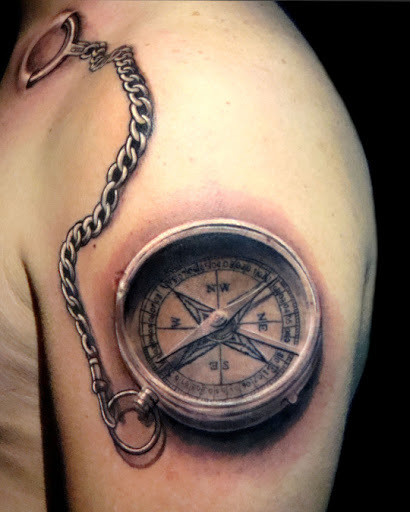 A three dimensional tattoo of a compass and its chain. 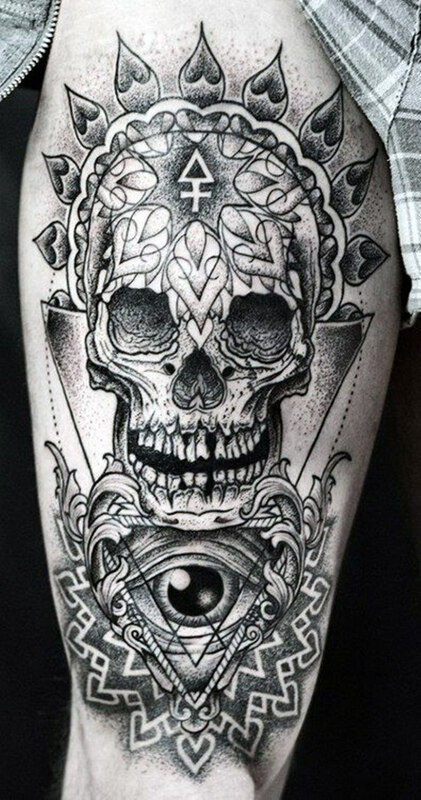 A large skull tattoo on the legs. 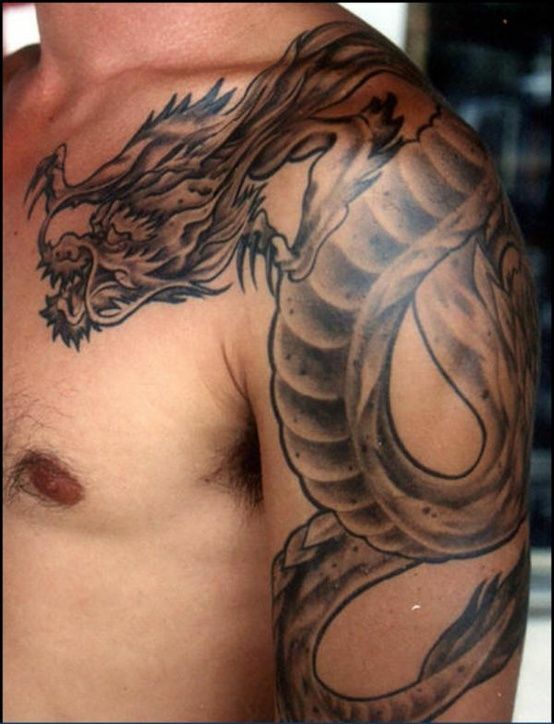 A large sleeves and chest tattoo of a Chinese Dragon. 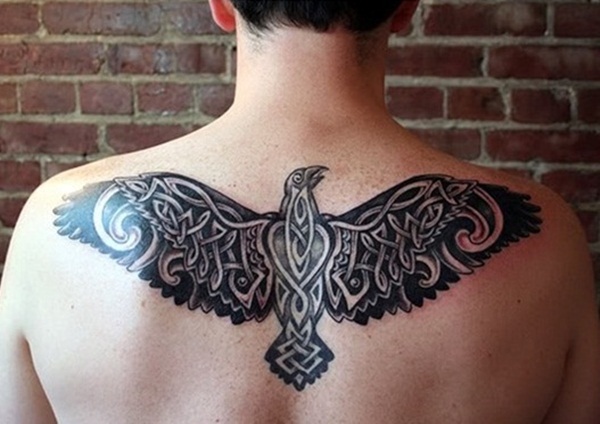 A Viking tattoo of a soaring bird on the upper back portion of the body. A sleeve tattoo of an eagle holding a snake in tribal detail that is inked on the sleeves area. In the various islands spread across the Southern Pacific Ocean, the practice of tattooing for social standing is still in practice especially in the far-flung islands like in Kiribati and Micronesia. When a man increases in status in their tribe or society, tattoos are being added to the man’s skin. Each tattoo added becomes more complex than the last. A tribal tattoo on the chest and sleeves area with clear art deco influences. 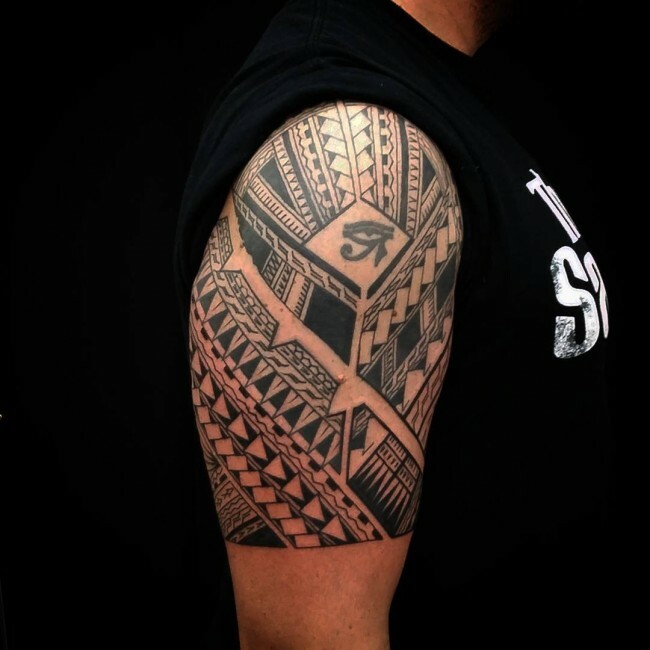 An highly detailed tribal tattoo on the sleeve with Samoan and other South Pacific tribal detail. 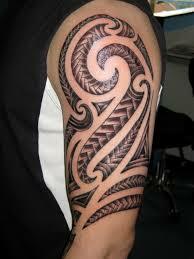 An intricately designed tribal tattoo on the arm with Maori detailing. An upper back tattoo of a horse’s head in tribal detail. A Polynesian themed sleeve tattoo. In Europe, some knights in a few kingdoms, dukedoms, and principalities have tattoos to signify their rank and the vassal house they are in. These tattoos will be most often depict their sigils or their house animals like a wolf or a dragon. Others may have the tattoo of their house motto. 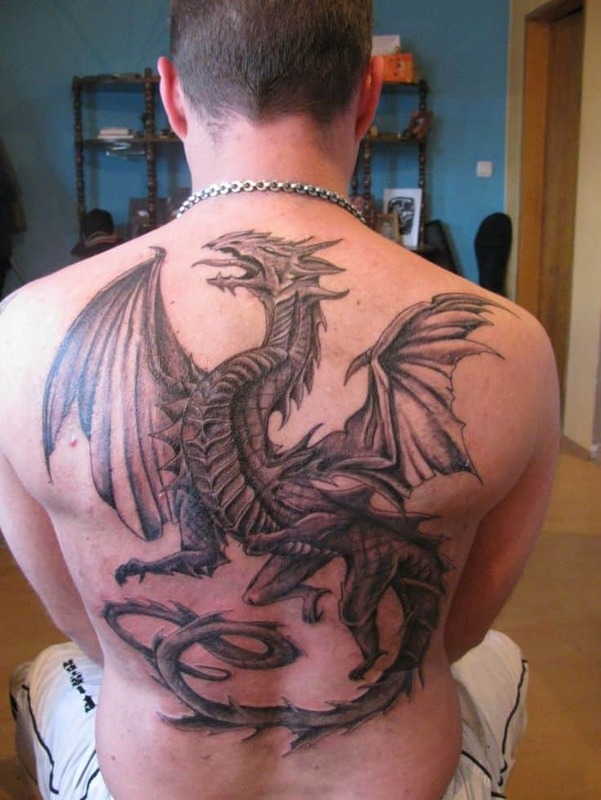 An intricately designed full back tattoo of a European Dragon. 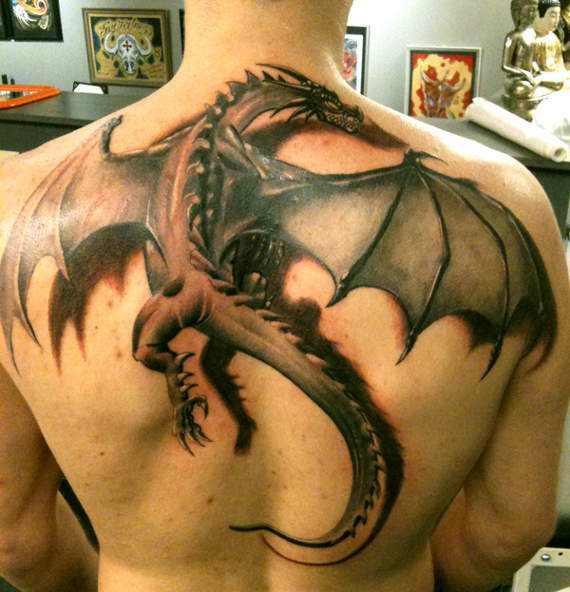 A large back tattoo of a European Dragon. 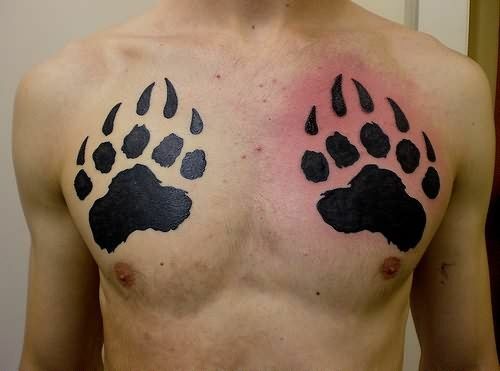 A large chest tattoo of a bear’s two paws. 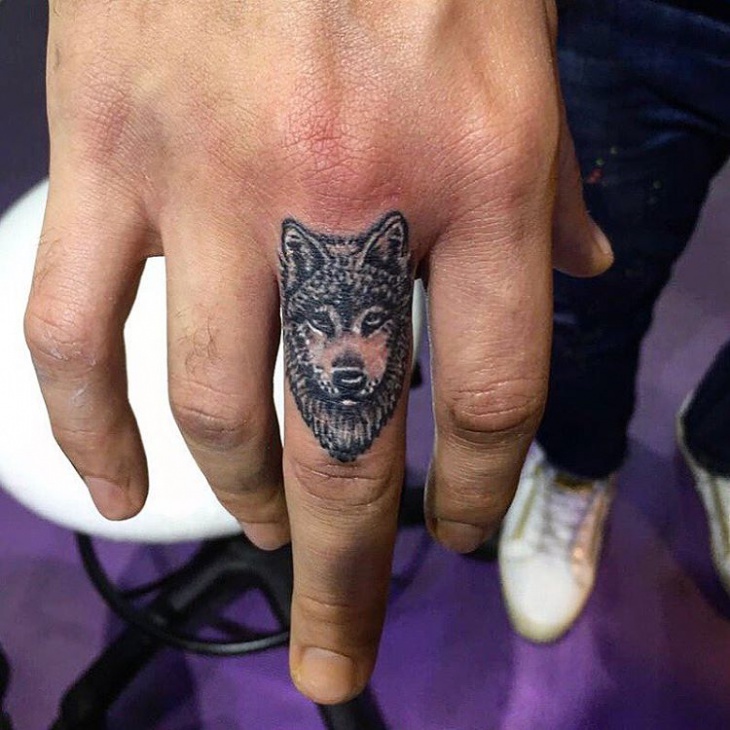 A tiny wolf tattoo on the middle finger of the hand. 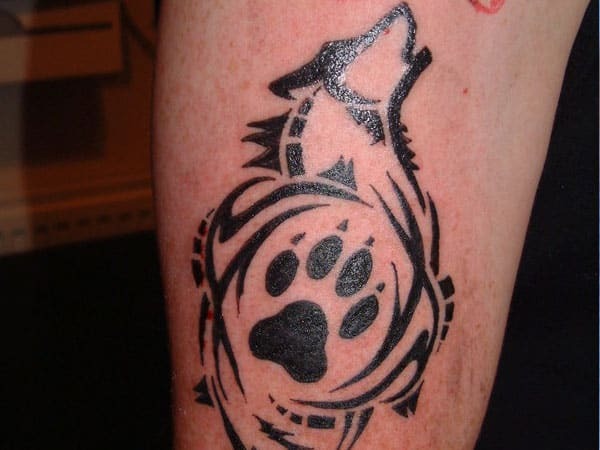 A tribal wolf tattoo on the sleeves area of the body. In Asia, men usually have tattoos inked on their skin if they are a member of a gang or a syndicate. These tattoos existed at the same time as the syndicates and the tattoo would always depict the symbol of their group. In Japanese society, senior members of the Yakuza syndicate would have colorful oni mask tattoos as a symbol of their rank within the group. 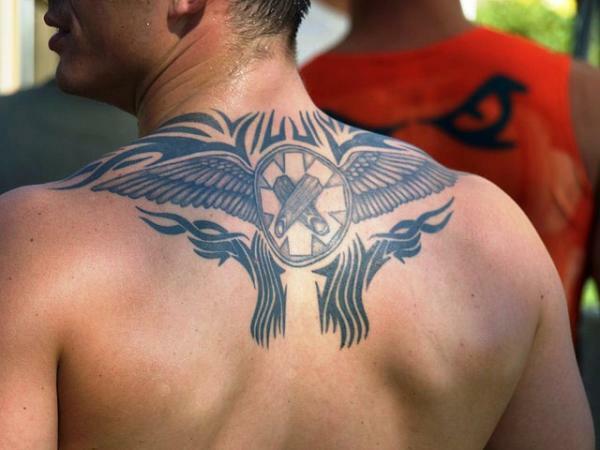 In China, Triad members would most often have a dragon tattoo. 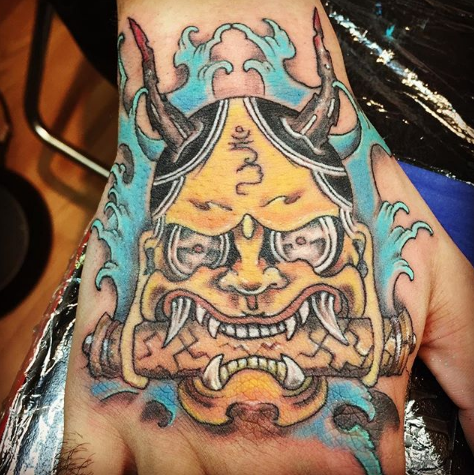 A hand tattoo of a yellow or gold oni mask. 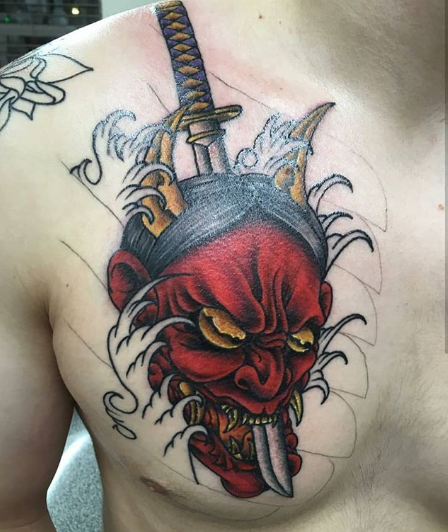 A colorful chest tattoo of an oni mask with a samurai sword pierced on top. 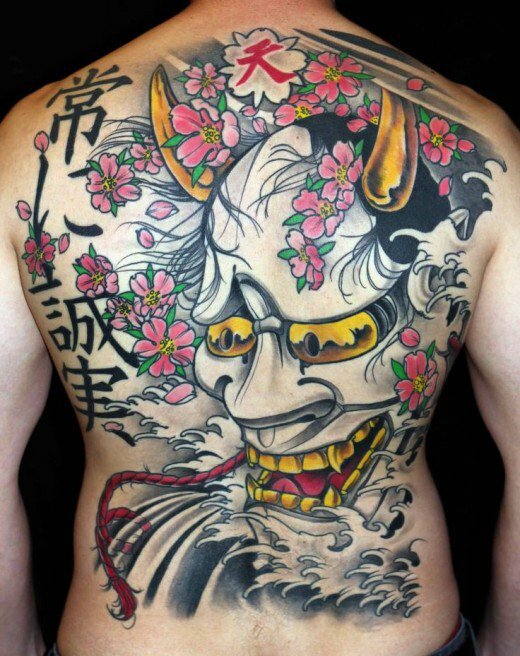 A large and intricately designed full back tattoo of an oni mask. 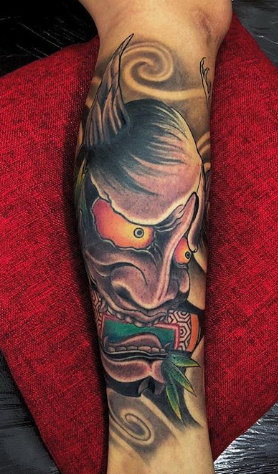 A colorful but slightly faded oni mask tattoo on the sleeves. 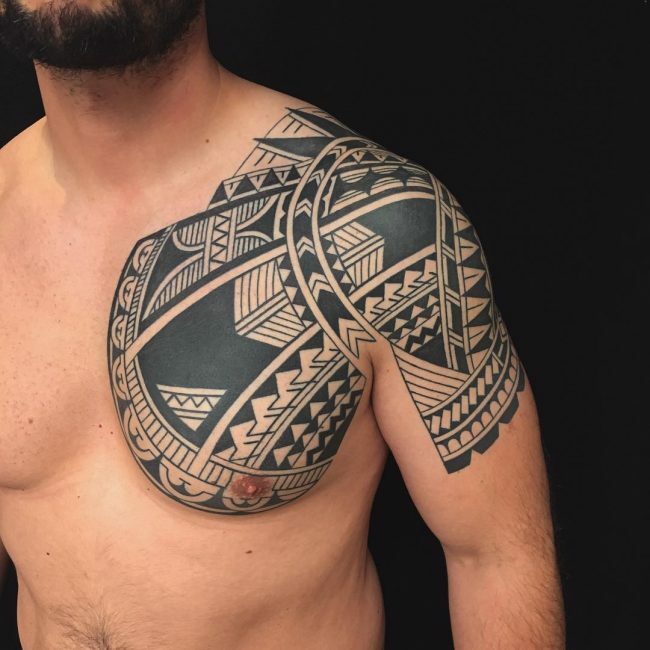 Tattoos on men also have a huge contribution to other cultures and societies that are not mentioned in this section such as the Native American and Aztec tattoos. These tattoo designs were also conceived as a symbol of a man’s status, influence, and standing in their respective societies. You could do a lot more research on the topic so that you may know and discover a lot more tattoo ideas for men that would best suit you. What Are The Most Popular Tattoo Ideas For Men? This question can be quite tricky to answer because a tattoo design’s popularity will solely be based on the culture, society, and environment you grew up in. If you ask around, you will be given a lot of different answers without a clear consensus of what really is popular. Worry not, however, as will be sharing with you a lot of popular tattoo ideas for men. These answers came from our friends across the world so that we could have a rough idea what are the world’s most famous tattoo ideas for men. 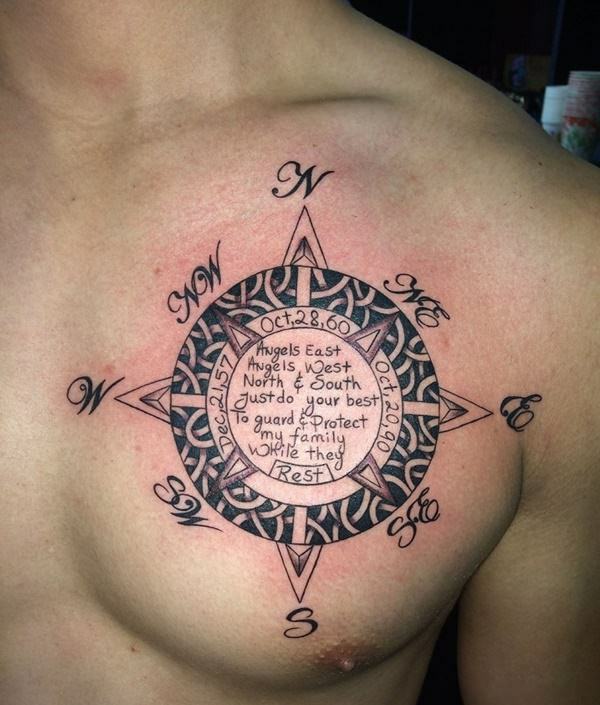 A compass tattoo on the chest with Viking details. 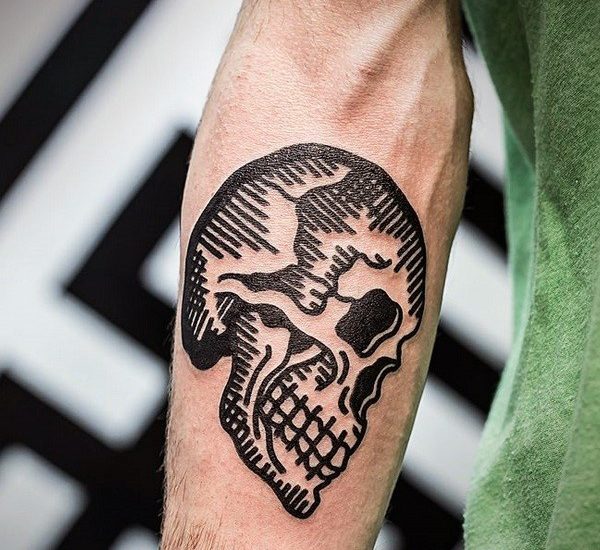 A neotraditional tattoo of a skull on the arm using only black ink. 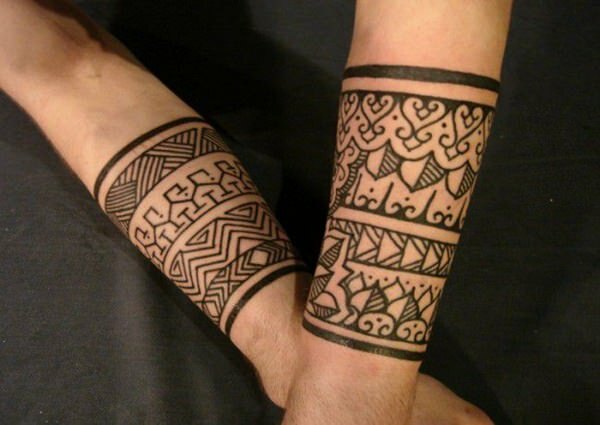 Undoubtedly, tribal tattoos will be considered on this list since this tattoo design houses a lot of other tattoo designs under it. This specific tattoo design can be generally considered as one of the world’s most famous tattoo ideas for men. Its usage from the old world until today in the modern world is something to look up into. This tattoo has a colorful and symbolic contribution to various societies and cultures across the globe. 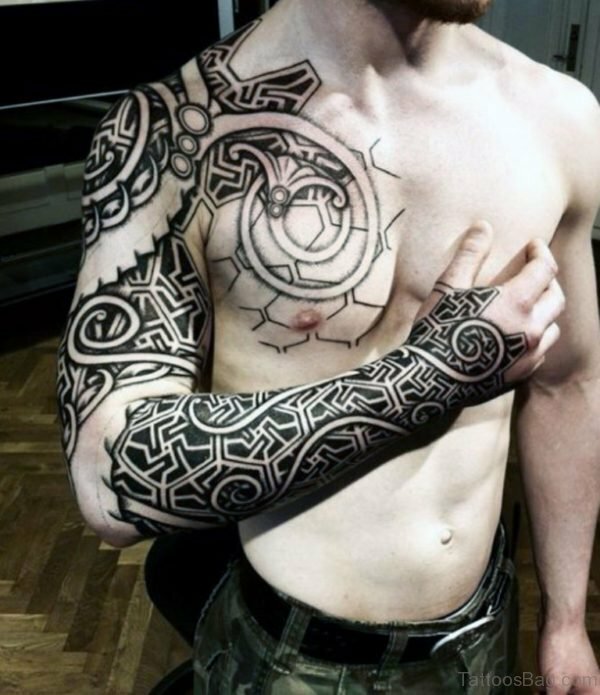 An arm tattoo of a tribal pattern design. 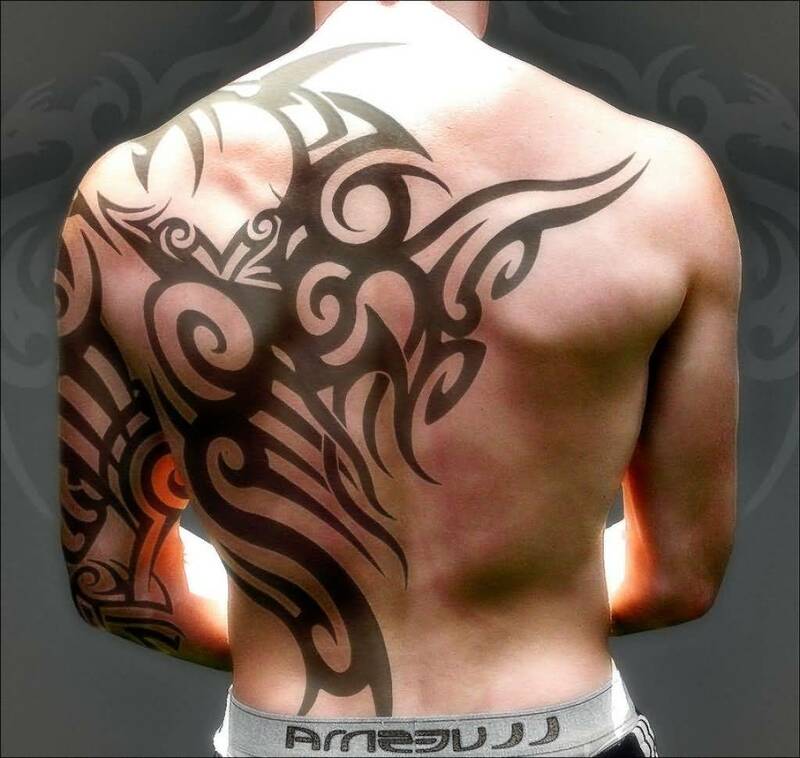 A large modern tribal tattoo on the back. 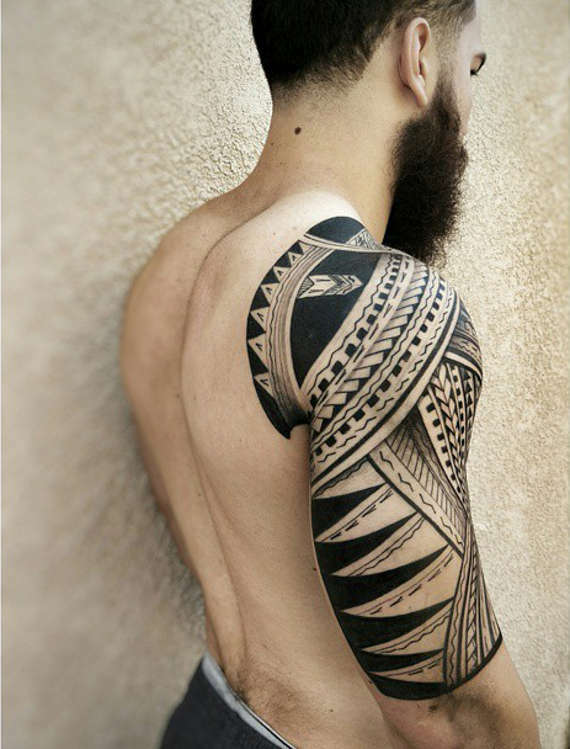 A tribal tattoo on the sleeves area with various Maori detailing. The tribal tattoos we know today can be traced back to the isolated and diverse islands of the South Pacific region. From these islands, the modern day tribal tattoo design emerged as a symbol of a man’s status, standing, and influence in a society. This was the sole purpose of this tattoo in the days of old; to be a symbol and not an artistic way to depict one’s personality. A Polynesian themed tribal tattoo on the sleeves. 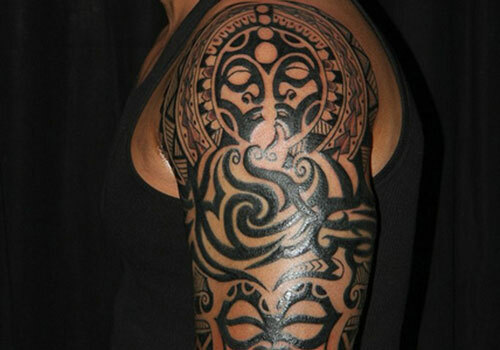 A Polynesian themed tribal tattoo on the arm. A tribal tattoo of an octopus on the sleeves and chest area of the body. From these designs, the modern age man slowly morphed the tattoo to become something artistic while maintaining its original meaning. 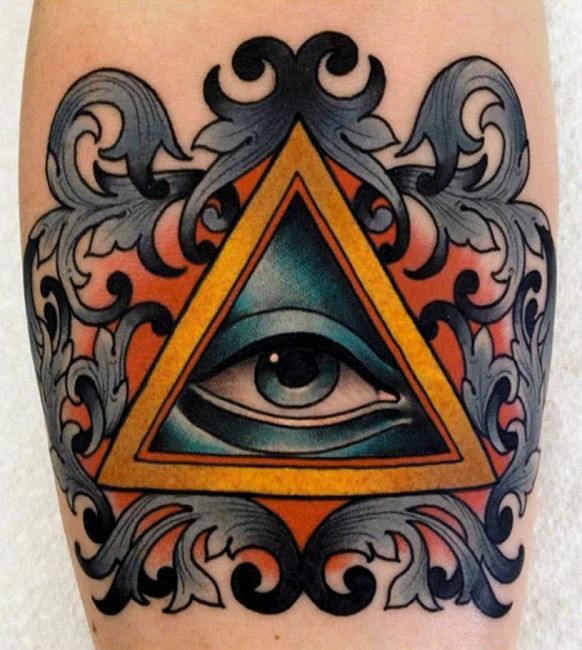 Out of this, various designs came up and dominated the tattoo industry and tattoo community to the point when the industry experts and tattoo artists admittedly said that the tattoo community is too condensed with tribal tattoos. 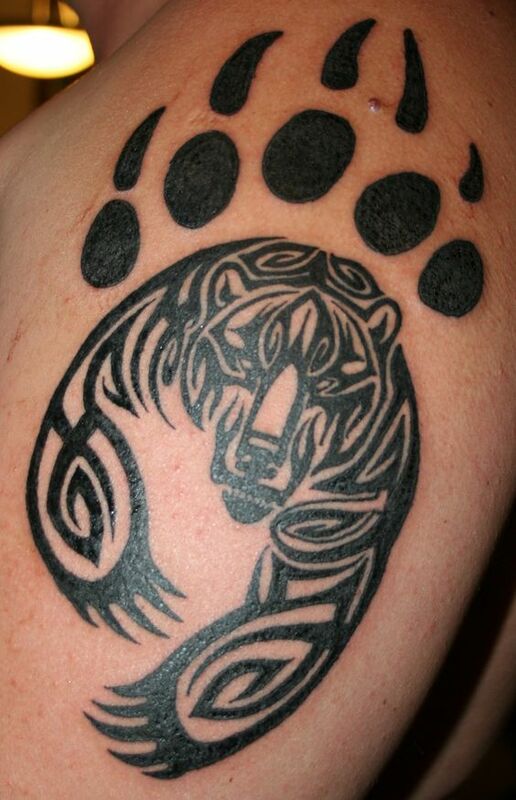 A shoulder tattoo of a bear running in tribal detail with its fingers and nails on top. 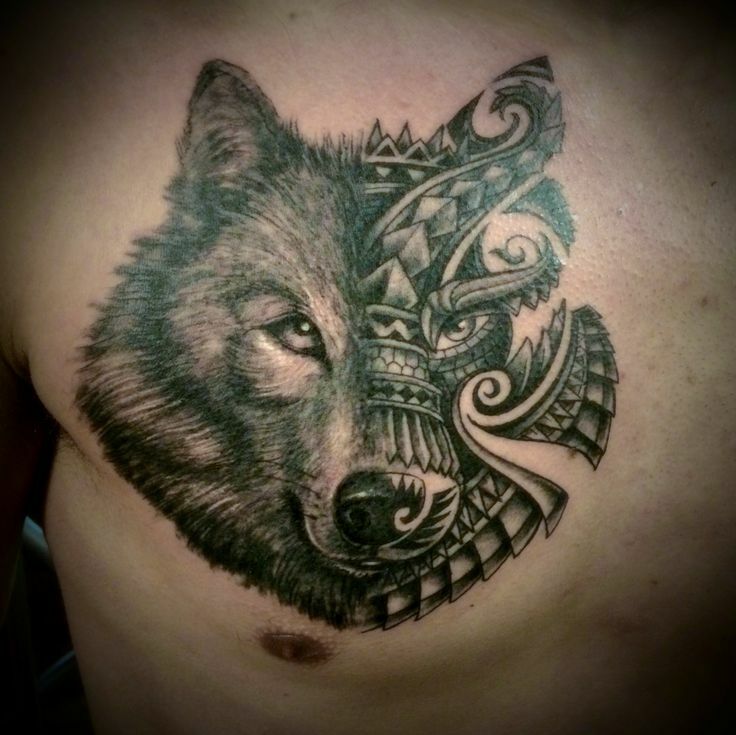 A chest tattoo of a wolf with half of its face decored in tribal detailing. Today, however, tribal tattoos are not that famous anymore but not in the sense that it is not known. Everyone and absolutely everyone knows what a tribal tattoo is and what it looks like but it is just that most tattoo enthusiasts and tattoo artists almost always veer of or stay away from this tattoo because it does not strike anyone anymore. It is now considered generic. But hey! If you think you can rock this tattoo without a problem, who are we to judge right? A tribal tattoo of a wolf and its paw on the thigh. 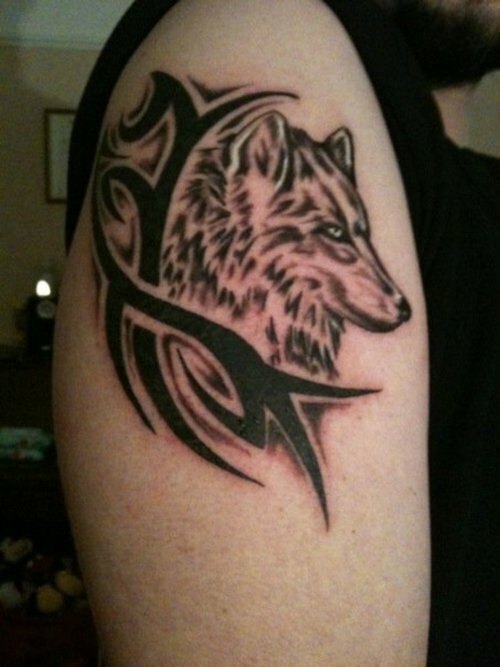 A sleeve tattoo of a wolf with tribal detailing. A chest tattoo of a tribal styled minotaur. An upper back tattoo of a tribal themed design. A large tribal tattoo pattern on the chestal area. Neo-traditional tattoo designs are like tribal tattoo designs in the sense that it also houses a lot of tattoo designs under its belt. This tattoo design was made because most tattoo designs of the day were considered as dated, old, and inappropriate in today’s modern world. 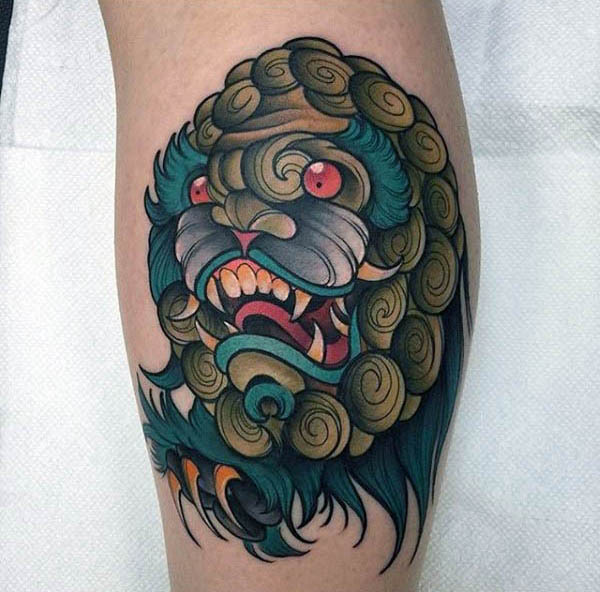 Tattoo artists from across the globe and in fact, the who tattoo community teamed up to revive the classic designs of the good old days and breath new life to the once considered old design. 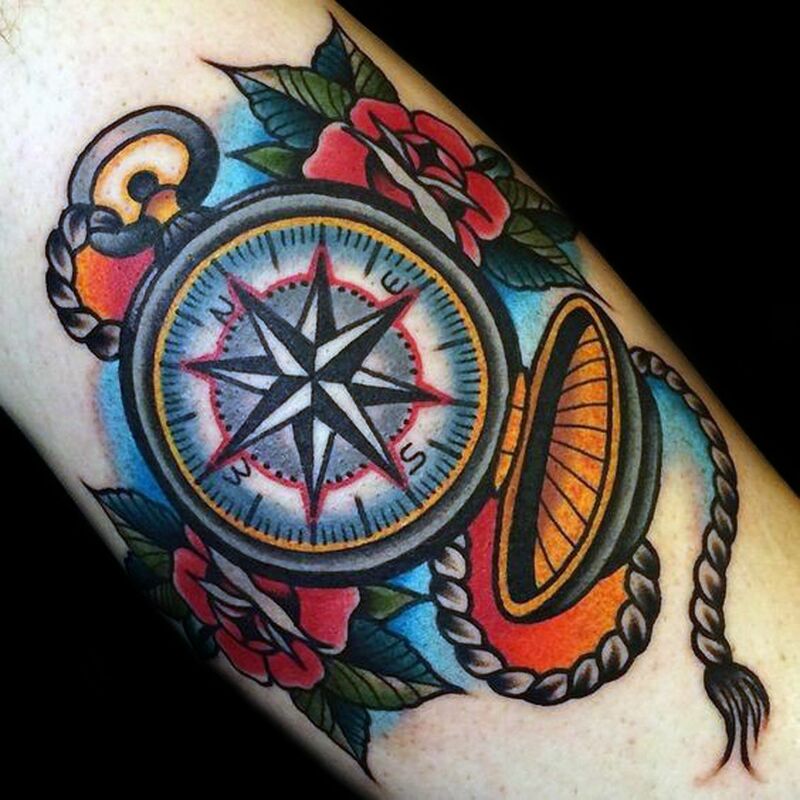 A colorful,vibrant, and intricately detailed neotraditional tattoo of a compass. 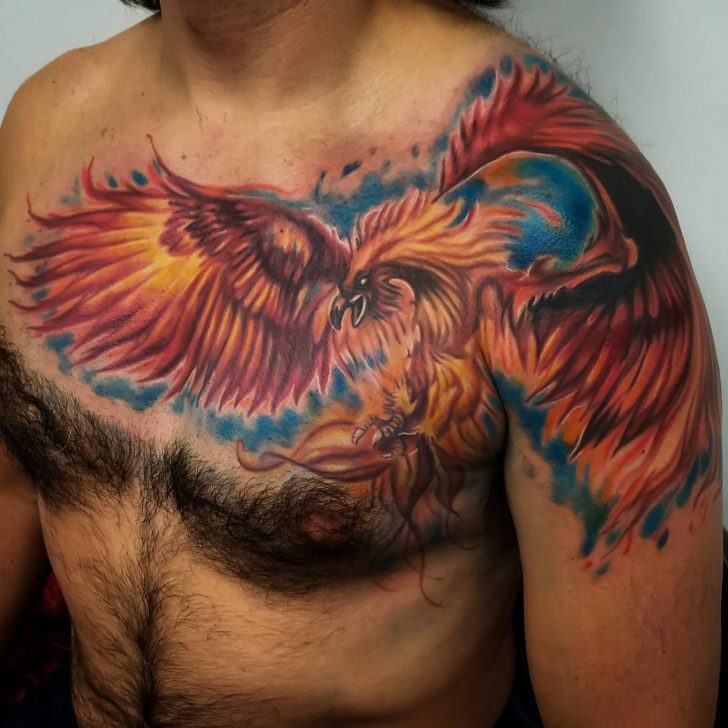 A large and colorful neotraditional tattoo of a phoenix in flight. 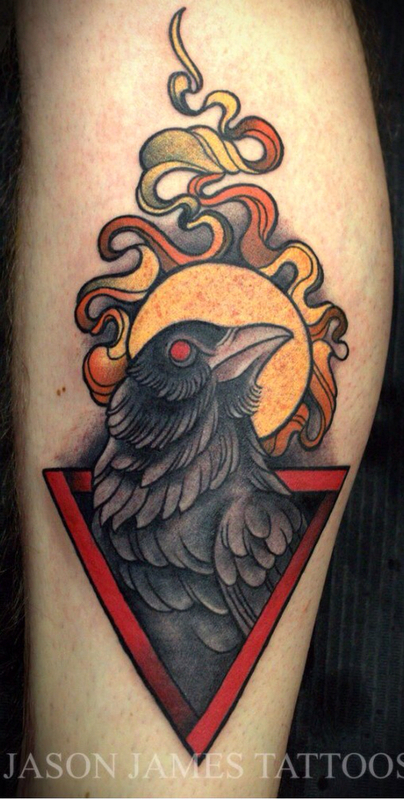 A colorful neotraditional tattoo of a crow on the leg. 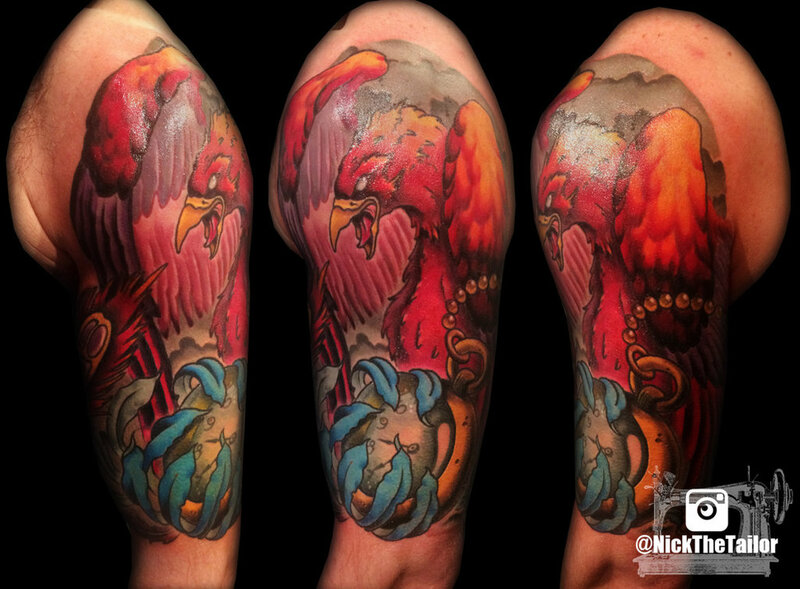 A colorful and vibrant neotraditional tattoo of a phoenix on the sleeves. 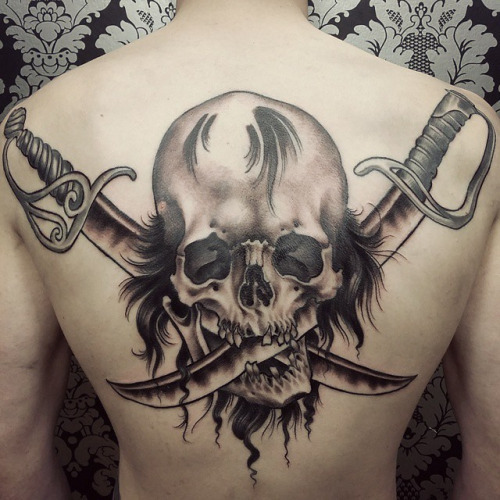 A neotraditional tattoo of a skull with a pirate’s hat and a knife through the skull. Various artists tried bringing back the old tattoo ideas for men to the modern age. Most of these designs were really old like compass tattoos which were once used by the conquistadors of the Spanish Navy, bird tattoos, and other classic tattoo designs out there. 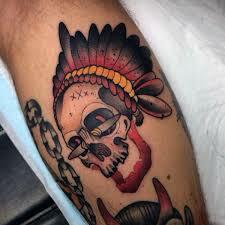 A neotraditional tattoo of a Native American Indian skull with a headdress. 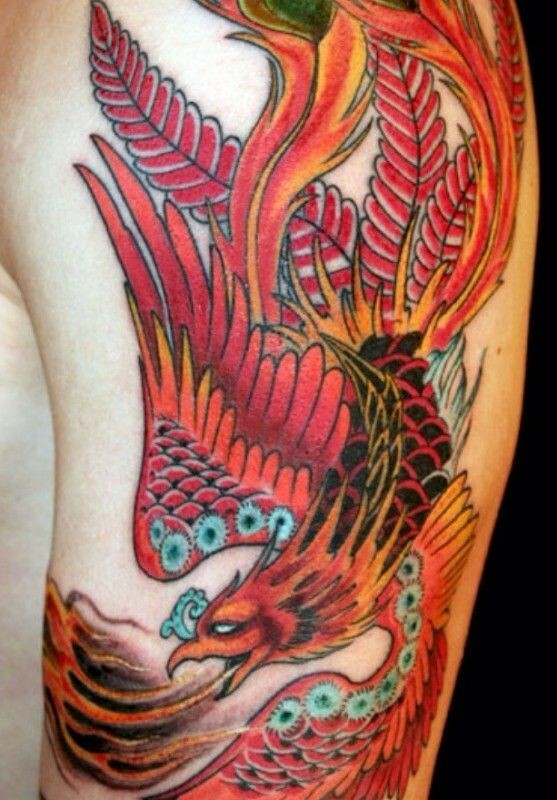 A vibrant neotraditional tattoo of a phoenix breathing fire inked on the sleeves area of the body. 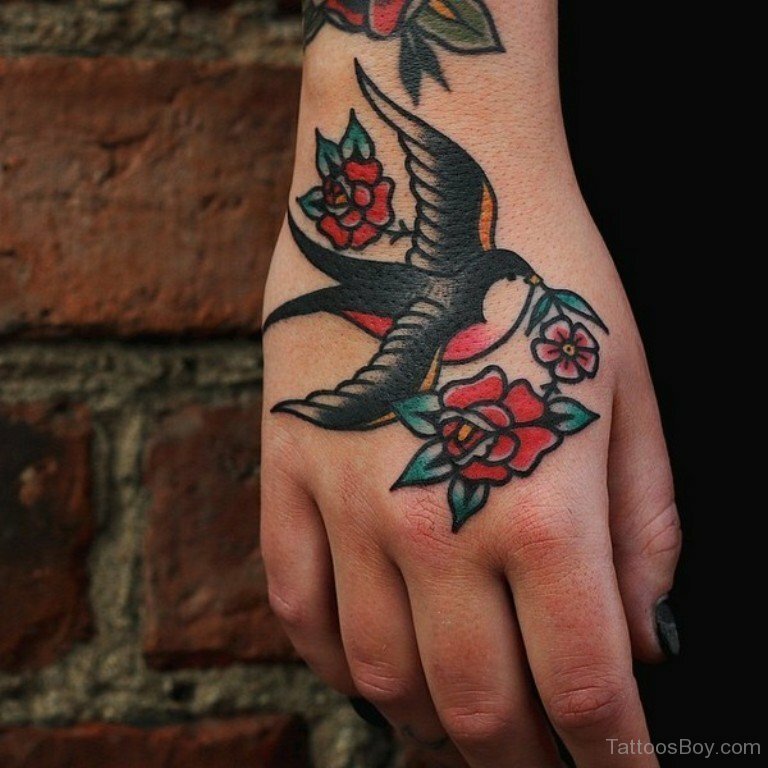 A neotraditional tattoo of a sparrow holding a flower inked on the hand. 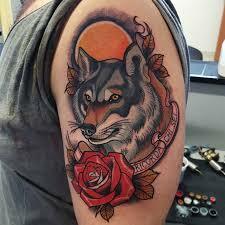 A neotraditional tattoo of a wolf and a rose on the sleeves area. 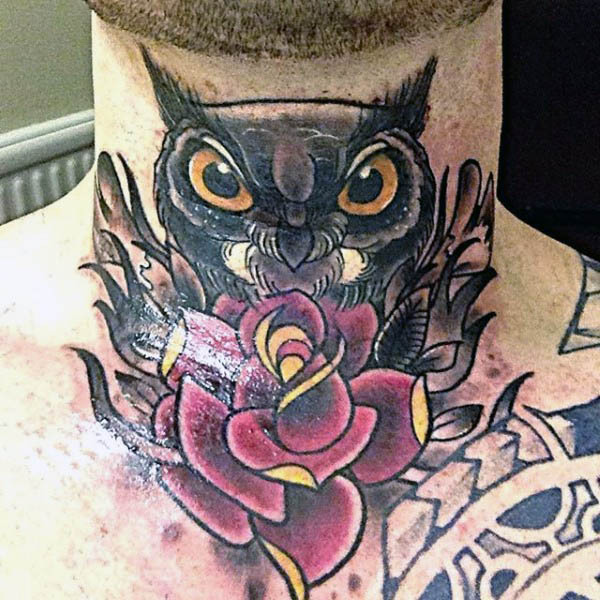 A neotraditional tattoo of an owl on the neck. Now this tattoo became famous quite recently and it also considered as one of the most popular tattoo ideas for men out there. This tattoo design is specifically not famous because of its looks because how can a semicolon look epic on the skin right? 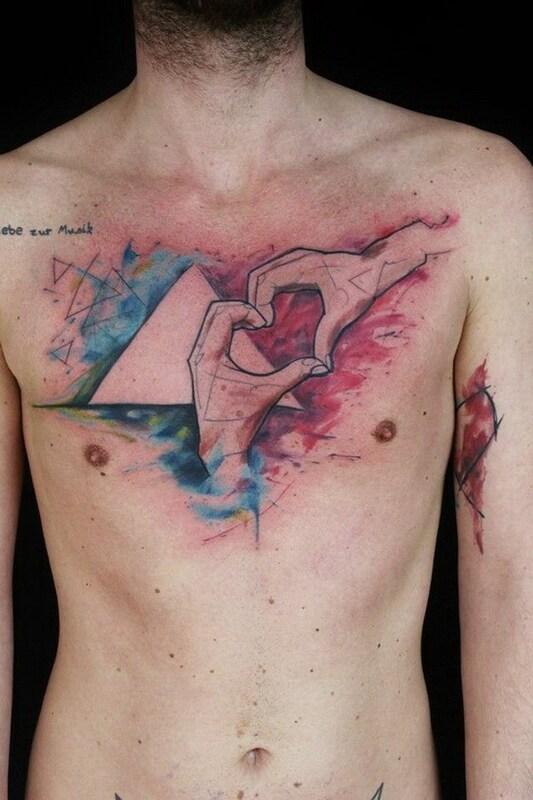 Rather, this tattoo became famous because of the advocacy it carries with it. A wrist tattoo of the word warrior with the semicolon symbol incorporated in the design. 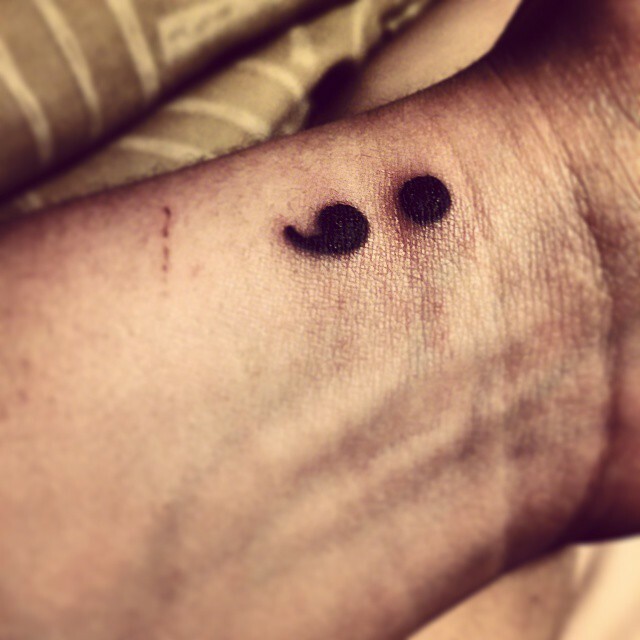 A wrist tattoo of a semicolon symbol. 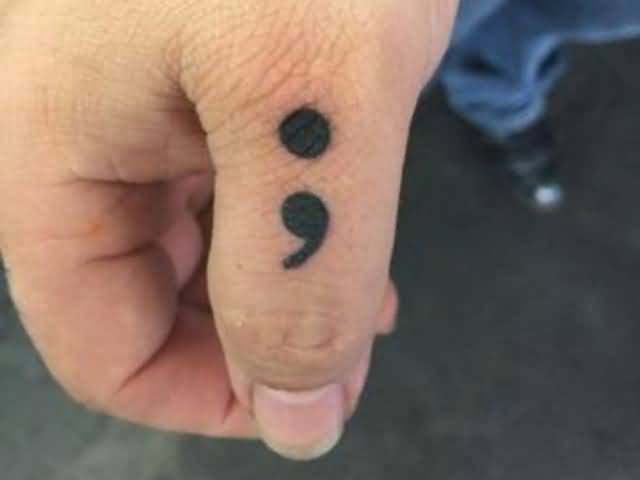 A finger tattoo of a semicolon on the thumb. 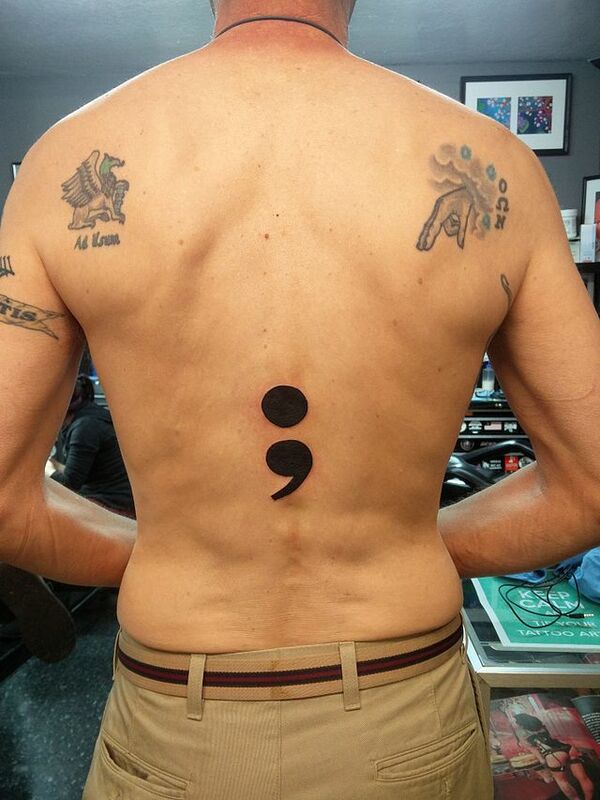 A big semicolon tattoo on the middle part of the back. 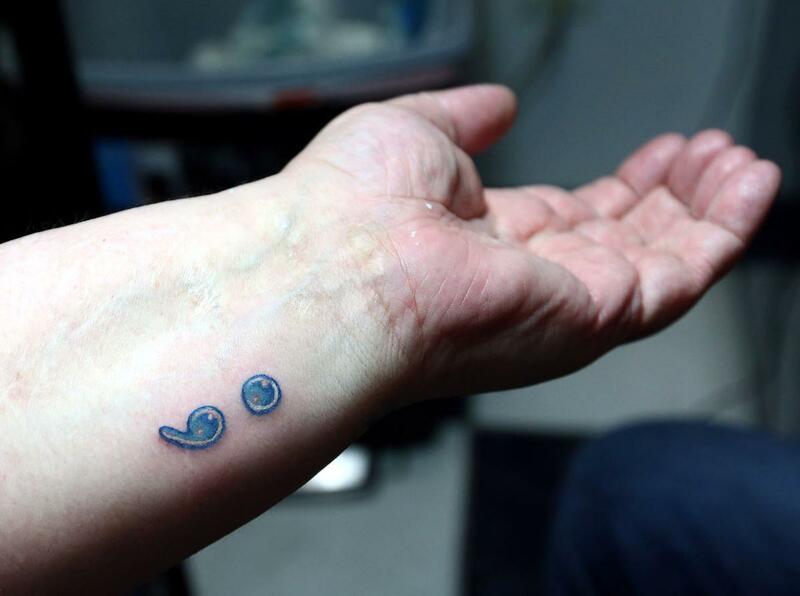 A three dimensional semicolon tattoo on the wrist. Semicolons are often used by writers and authors (like myself) as a punctuation mark to a statement we once considered finished but opted to continue to write. This symbol caught on the tattoo industry and tattoo community and they started devising various designs to incorporate the semicolon in their tattoo designs. 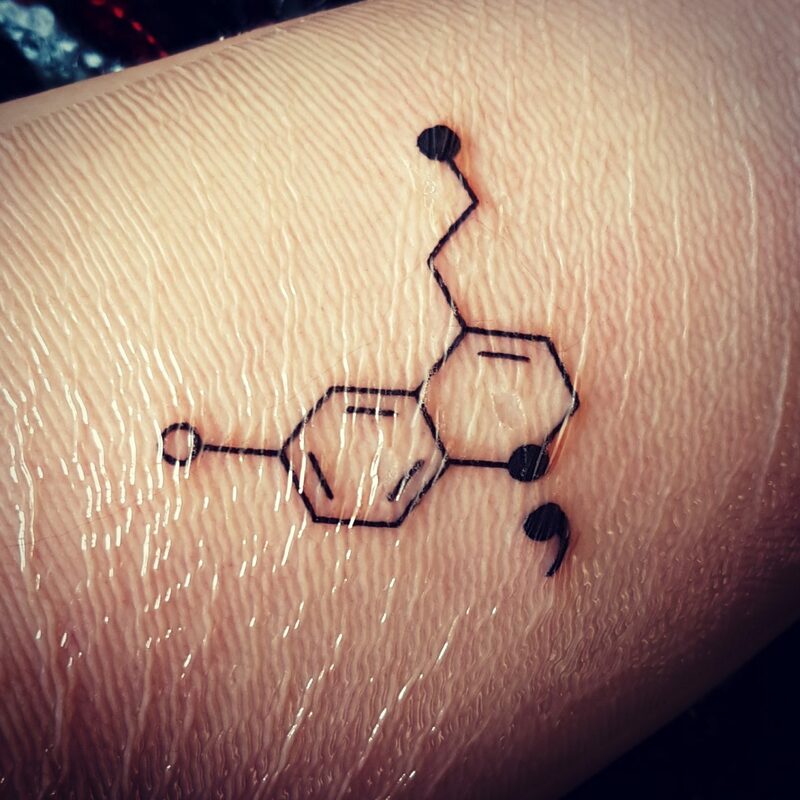 A semicolon tattoo incorportated on a chemical bond tattoo. 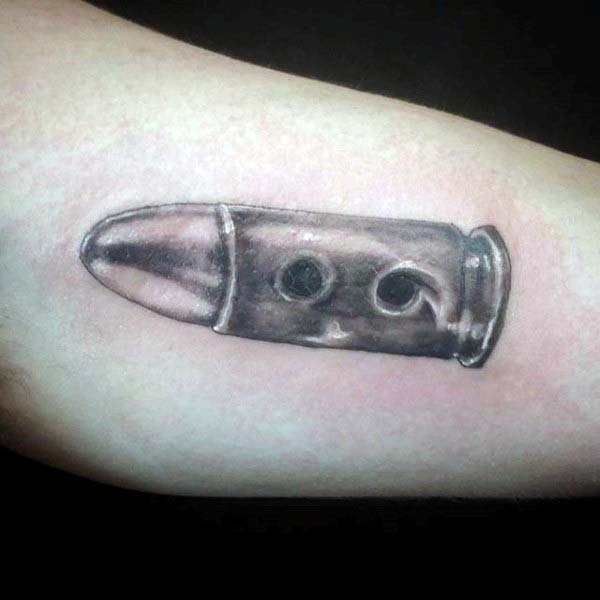 A sleeve tattoo of a bullet with the semicolon symbol. 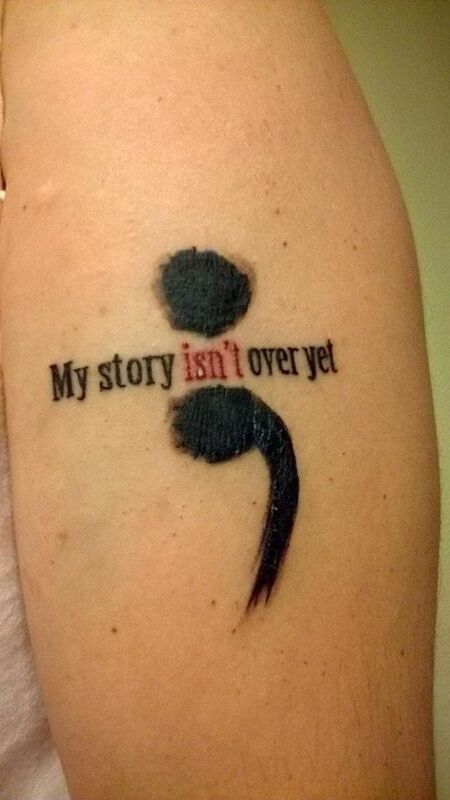 A medium size semicolon tattoo on the sleeves with the words “My story isn’t over yet”. The symbol thus began a double life as also a sign of a great advocacy on suicide and mental health issue awareness. Various news outlets like CNN, Fox News, and BBC caught on and featured the tattoo design which further contributed to its sudden rise to fame and in extension, the advocacy it carries along with it. 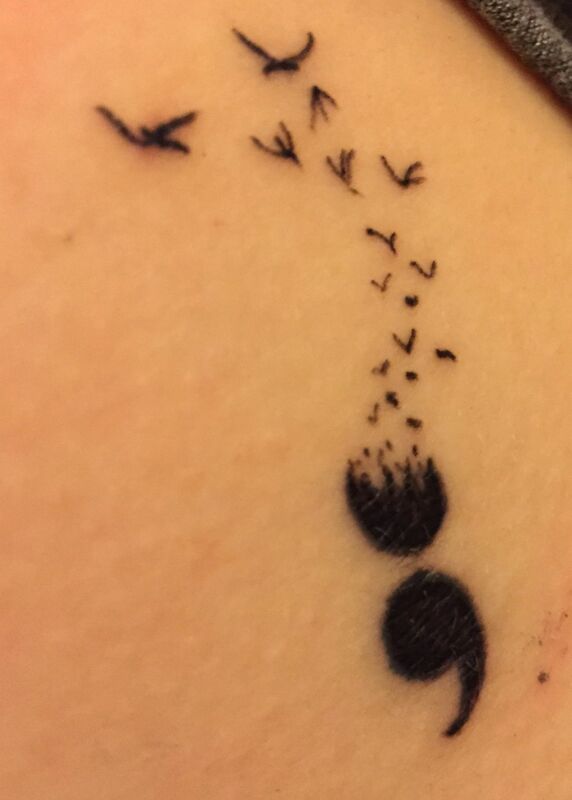 A semicolon tattoo slowly fading into a flock of birds. 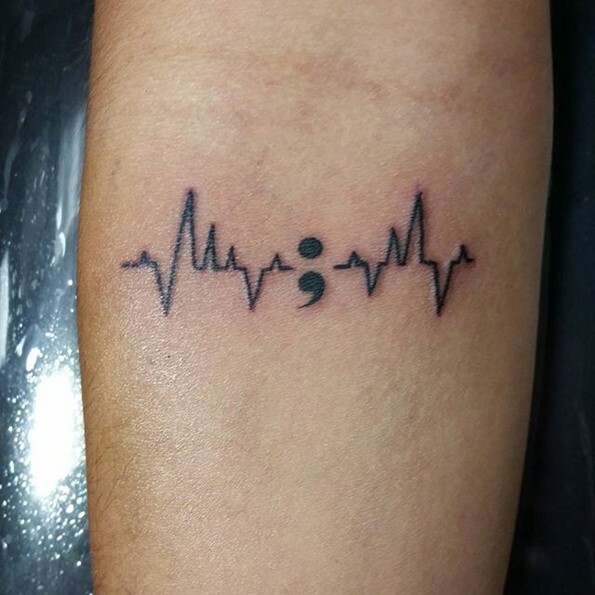 A semicolon tattoo on the arm that is incorporated in a heartline. 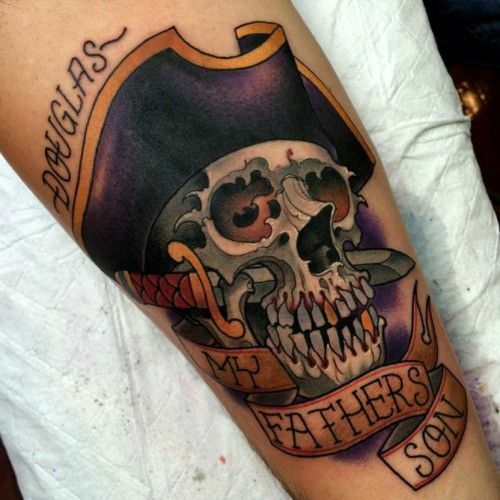 These are just some of the most famous tattoo ideas for men from across the globe. a lot more can be discovered with a few clicks and a few key presses so why not do your own research so you may discover a tattoo design that best suits you? You may even discover a tattoo design that we do not know of! Enough with the popular tattoo ideas for men. They already have a chunk of the tattoo industry and tattoo community’s spotlight far too long. They do not need more airtime. What this airtime deserves are tattoo ideas for men that are on the rise and are filled to brim with symbolism and artistic value. These tattoo designs are expected by tattoo artists and enthusiasts to dominate the industry in a few years. 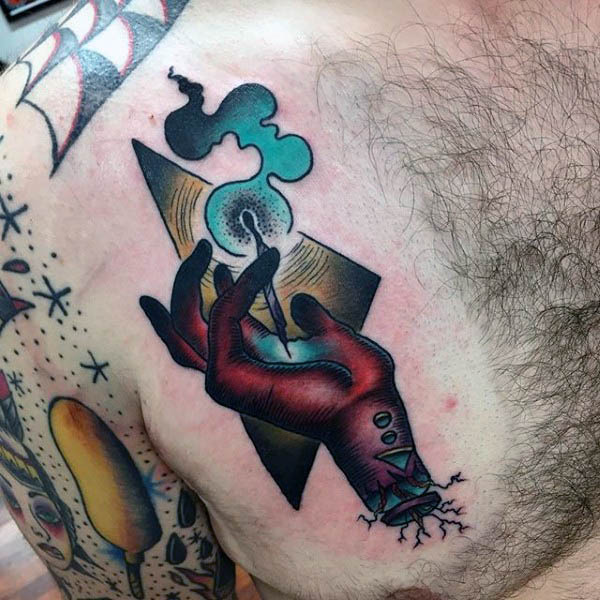 A colorful and vibrant neotraditional tattoo of a hand conjuring magic. This tattoo design has been talking point of the town for quite some time now. Although it is still not considered as a famous tattoo design yet, this one is definitely on the rise in a few years. 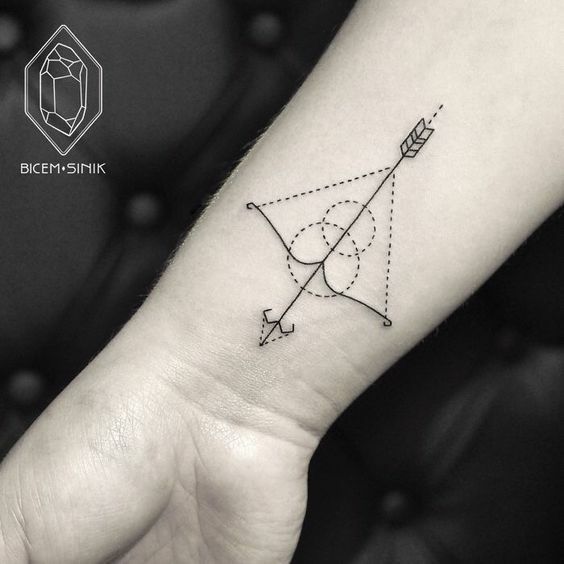 Geometric tattoo design is really thought of as a very artistic tattoo design with a heavy usage of lines and shapes to make an artistic point. 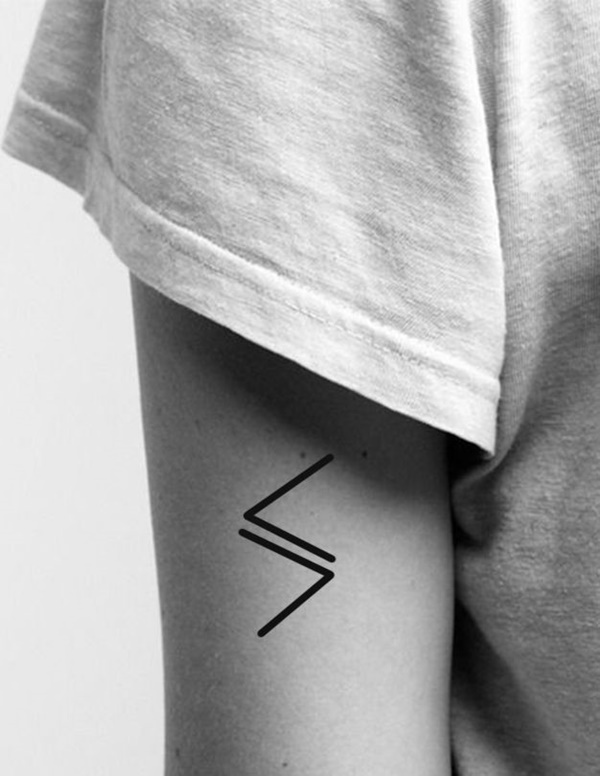 A simple geometric tattoo of the greater than and less than mathematical symbols on the sleeves area of the body. 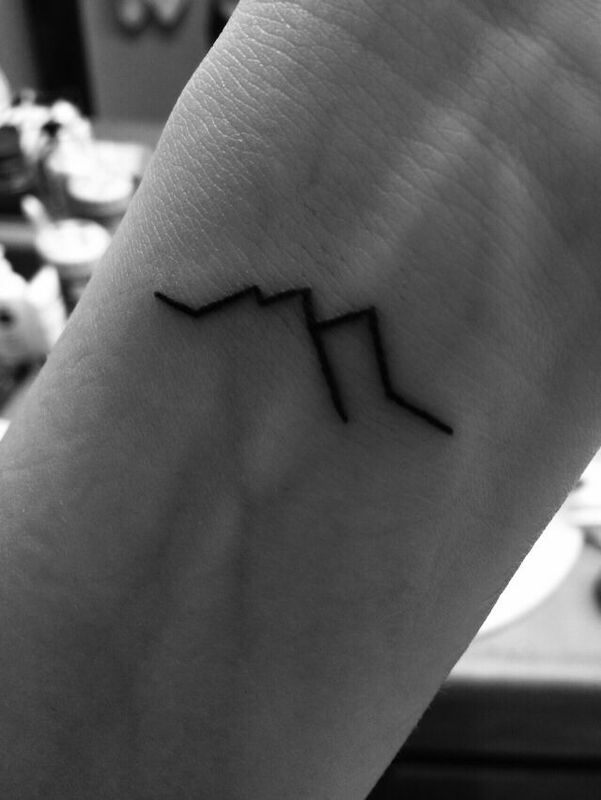 A simple geometric tattoo of a mountain range inked on the wrist. Low poly tattoo designs are also considered as a geometric tattoo design because it uses various shapes to form a common image and form. 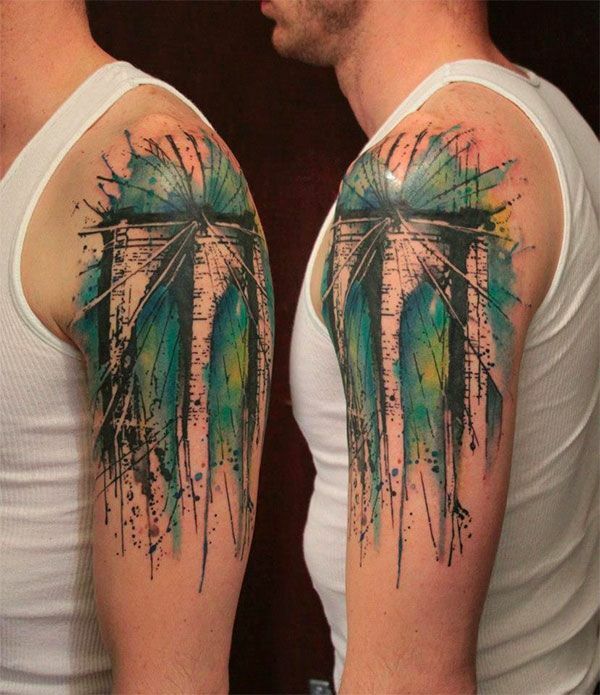 This tattoo is really famous for the artistic fellows because it evokes a unique and creative vibe whenever looked upon. 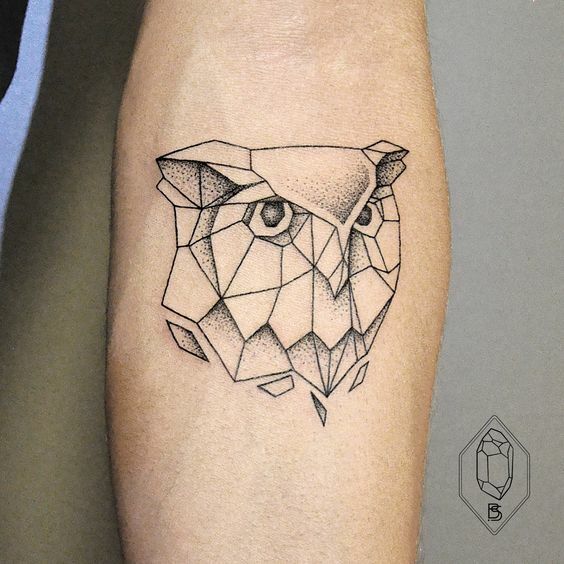 A low poly geometric tattoo of an owl’s face on the arm. 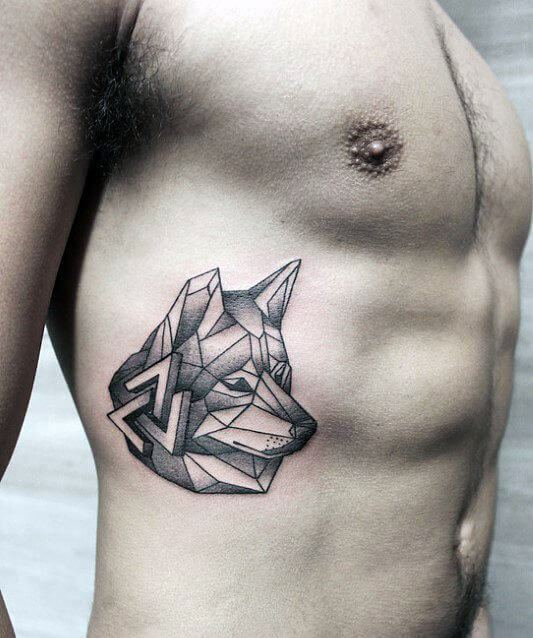 A low poly geometric tattoo of a wolf and the valknut symbol on the ribcage. 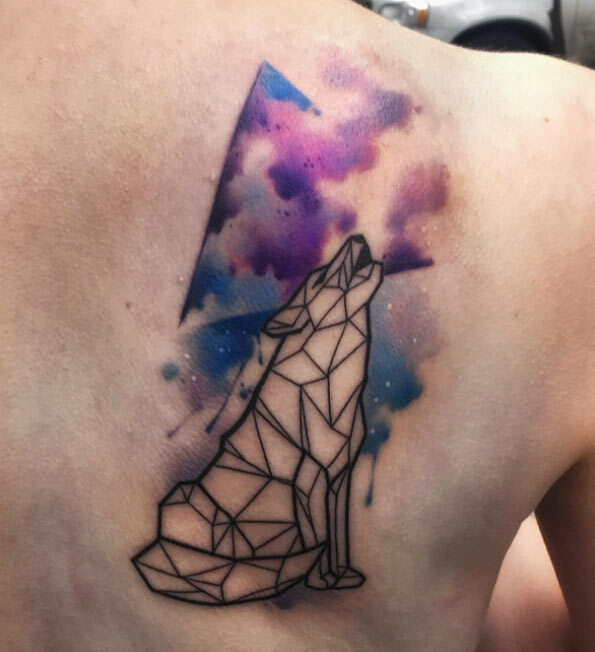 A watercolor low poly geometric tattoo of a howling wolf looking through the cosmos. 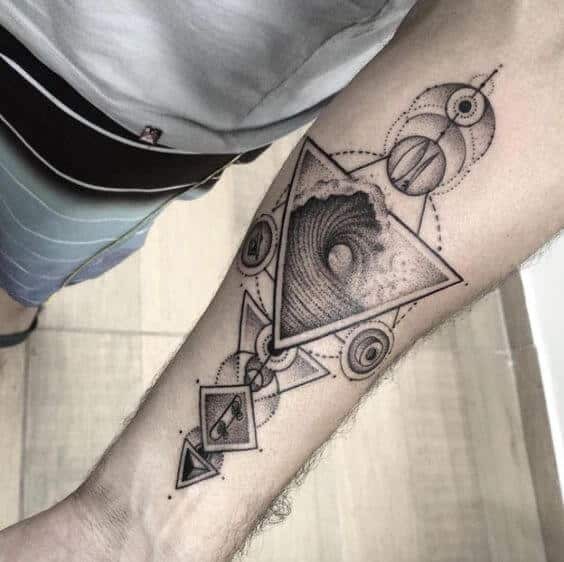 A very artistic geometric tattoo on the war with an image of a large wave. 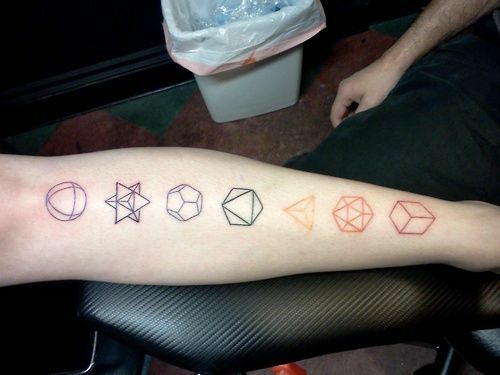 A simple geometric tattoo of a various three dimensional shapes on the arm. This tattoo design is really complex and thought-provoking so if you think you can rock this one out, be our guest! This tattoo design will definitely catch your eye whenever you see it. It may not be quite famous now but in a few years, we are absolutely sure that this design will explode the tattoo industry and tattoo communities. Steampunk tattoo design is a unique one in the industry. Only a few tattoo artists and tattoo enthusiasts know about this one. Same can be said to the science fiction genre it came from which is also said can be attributed to the silence of this tattoo design. No matter how silent, however, this tattoo design is now gaining traction in recent years and can be said as one of the rising tattoo ideas for men. 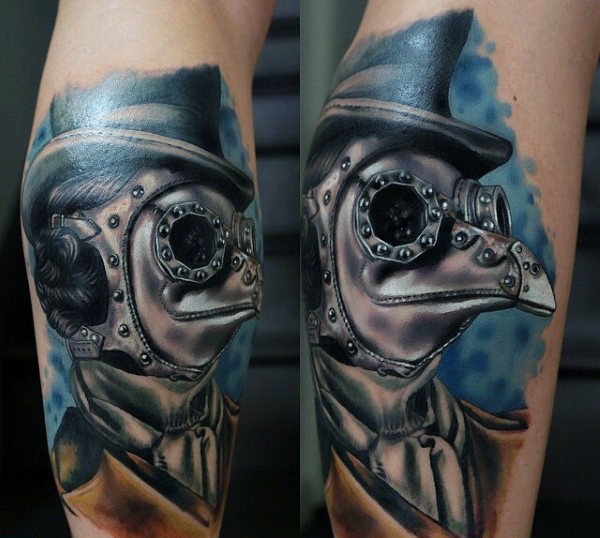 A vibrant neotraditional steampunk tattoo of a plague doctor on the arm. 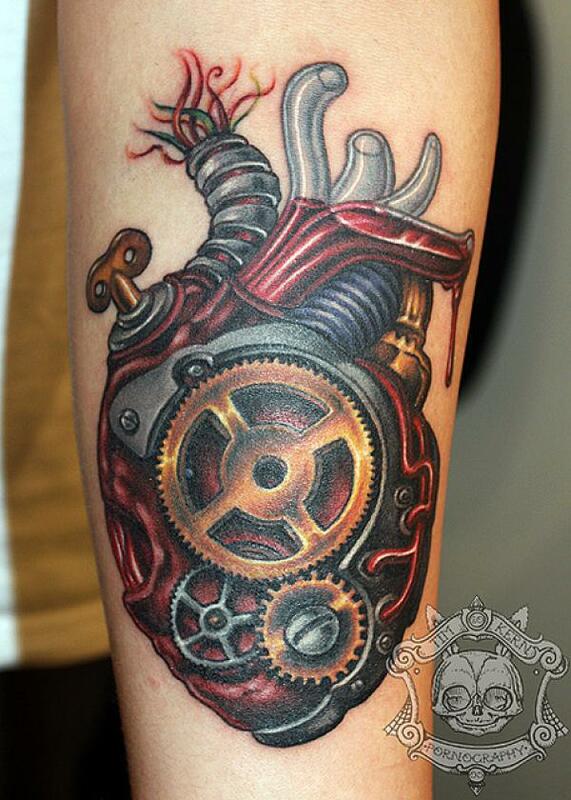 A neotraditional steampunk tattoo of a heart on arms. 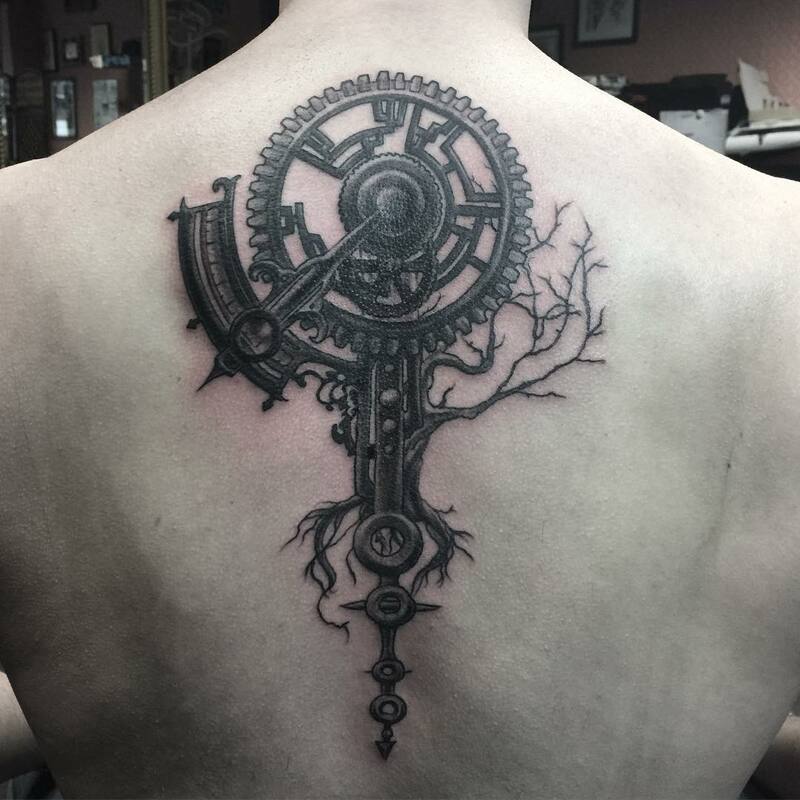 A steampunk tattoo on the upper back of a cog wheel with roots. 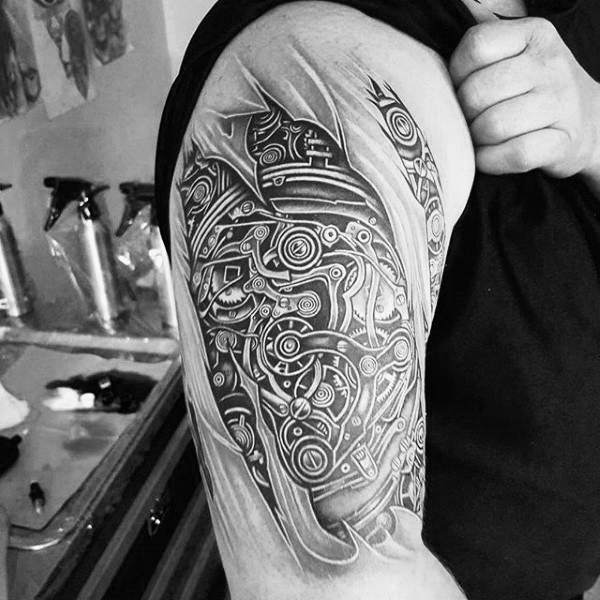 A beautifully designed steampunk tattoo as if the machinery is ripping through the skin. 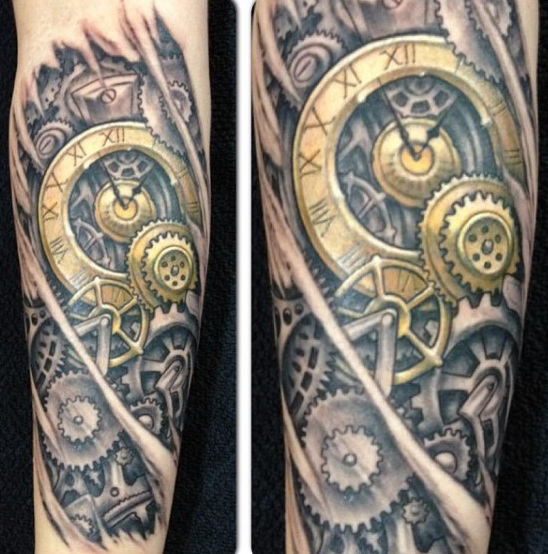 A steampunk tattoo of a clock and numerous cogwheels on the arm. 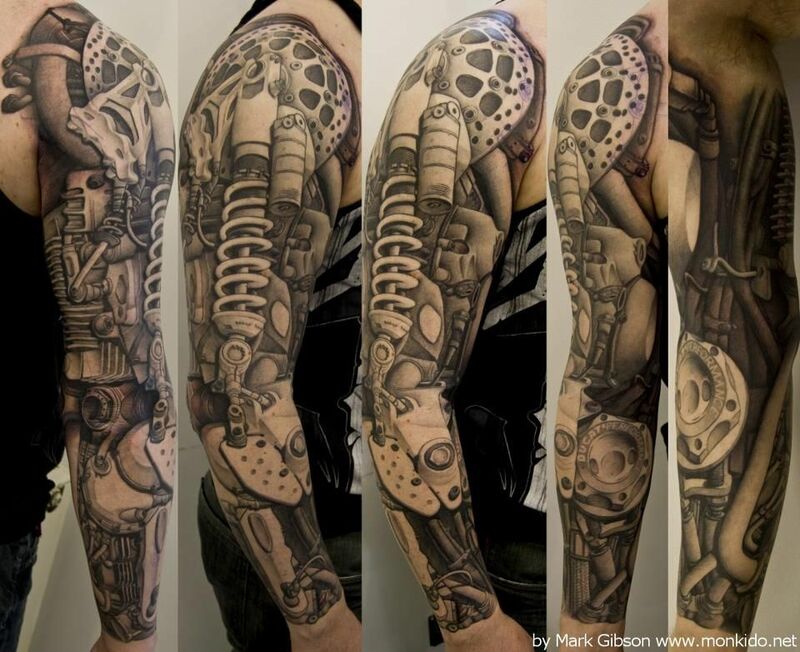 This tattoo design heavily features the inner workings of a 20th-century machine as its main theme. You will almost always see cogs and chains as its tattoo accentuation and they often go and mix with a lot of other design elements to make it even more unique and artistic than any other tattoo designs out there in general. 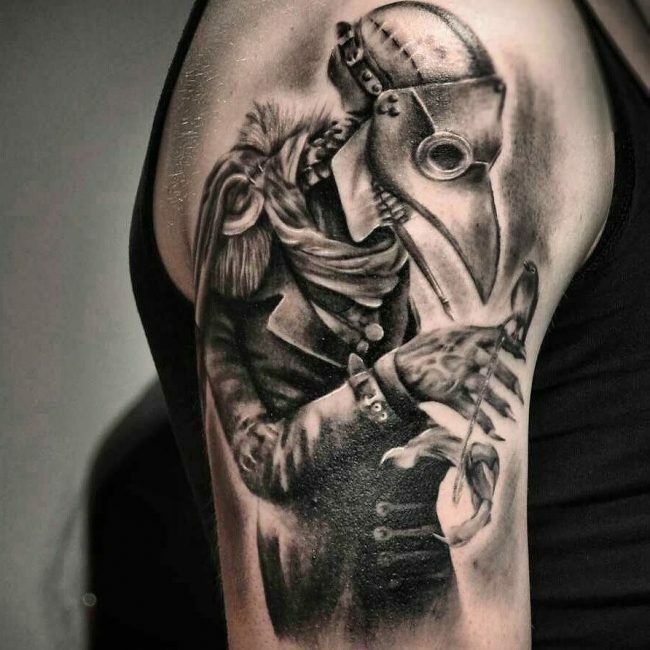 A steampunk tattoo of a plague doctor on the sleeves. 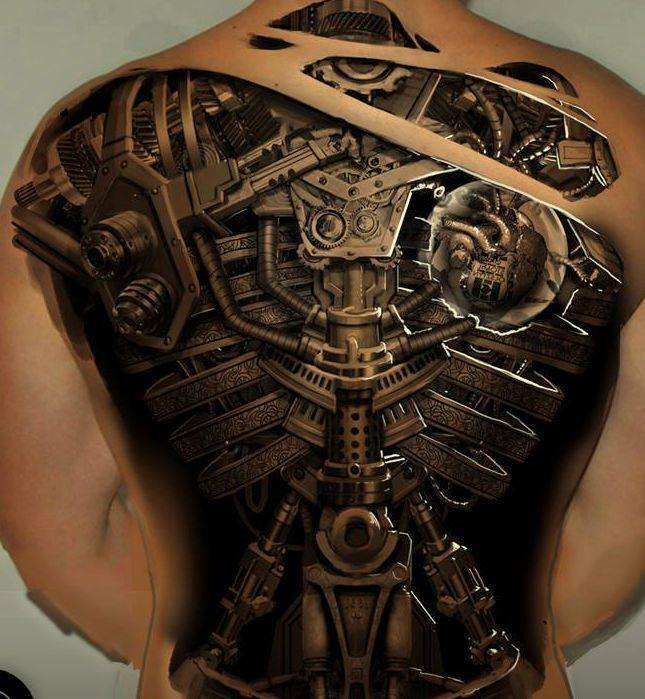 A large and intricately designed steampunk tattoo on the back of a robot’s ribcage and back. 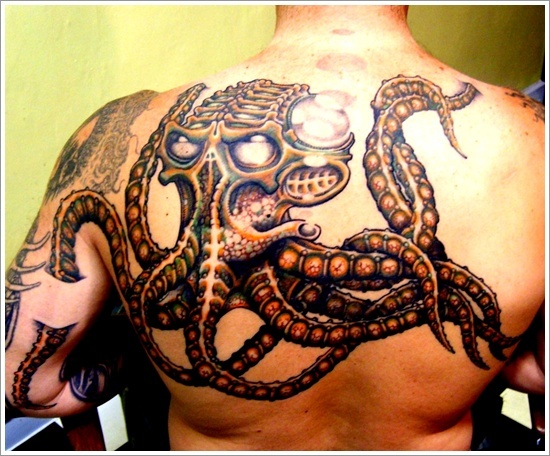 A steampunk tattoo on the rib cage of an octopus. A sleeve steampunk tattoo of a mad hatter with various steampunk tattoo designs. 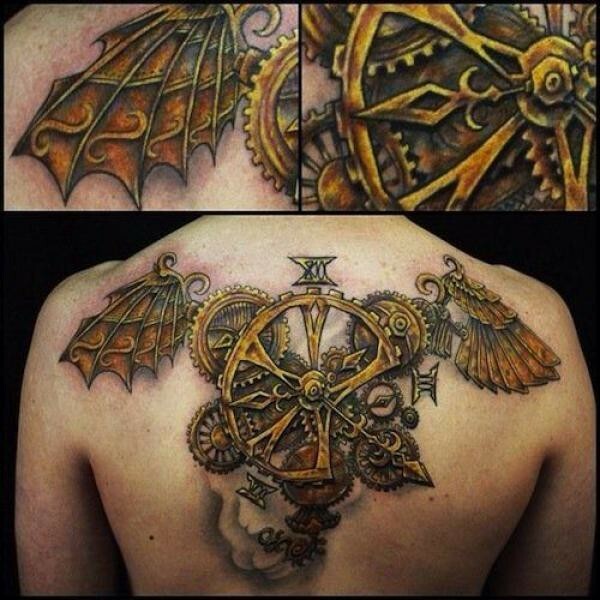 A large steampunk tattoo of a winged machinery with parts from a clock. Well, for this tattoo design, they were once famous and considered to be a good rival for tribal tattoos but fell flat on its face when it almost reached popular status a few decades ago. As of the moment, however, Aztec tattoos are now making a comeback and can be considered as one of the rising tattoo ideas for men of today. 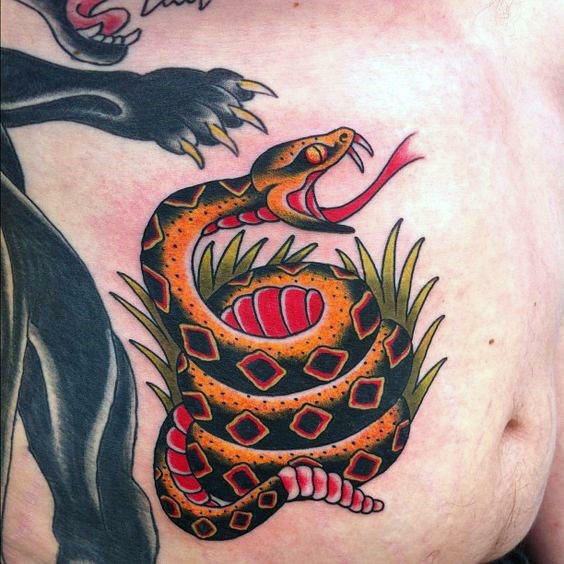 A neotraditional Aztec tattoo of a coiled up snake on the right side of the abdomen. 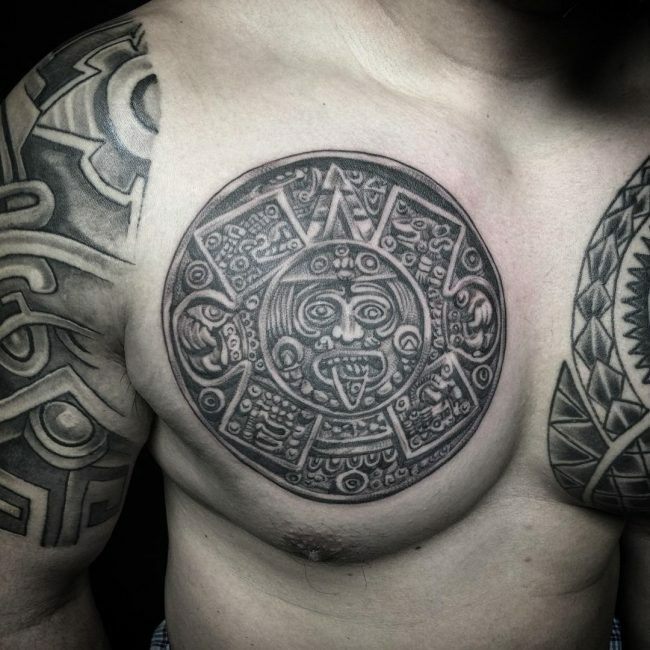 A large chest tattoo of the Aztec sun stone on the right pectoral muscle. 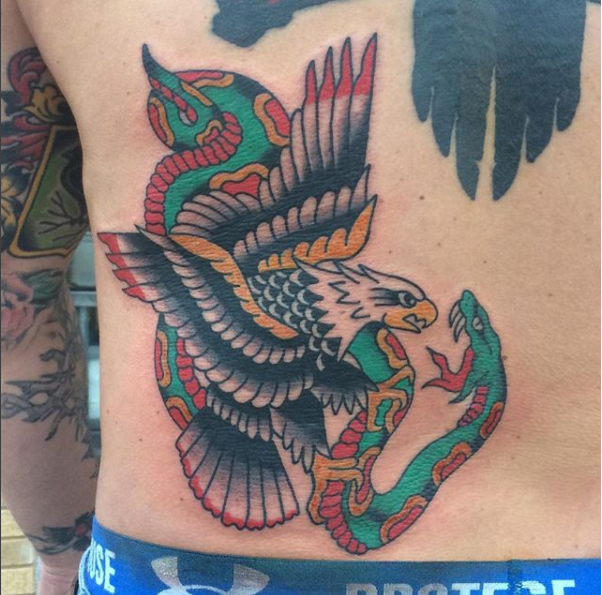 A neotraditional Aztec tattoo of an eagle and a snake on the lower back portion of the body. 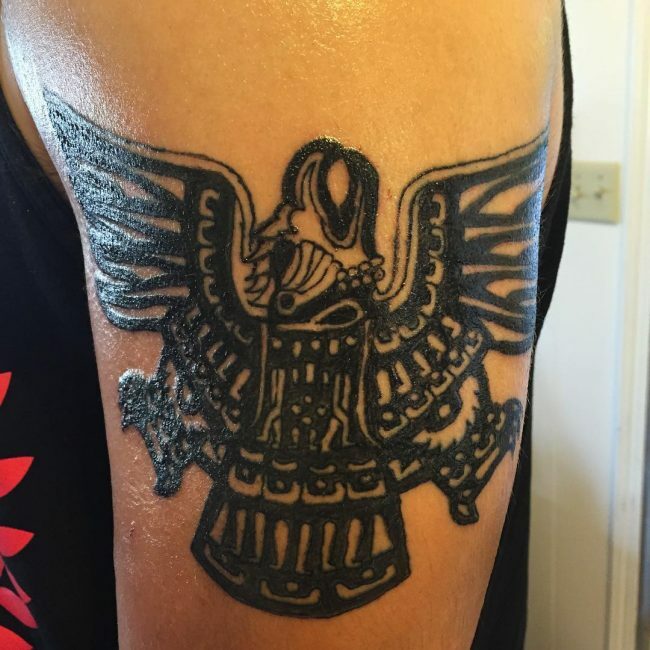 This tattoo design has a rich history behind it. Before being used by a lot of people, only a few have the privilege and the right to host one during the Aztec Empire’s age. This tattoo, once worn by kings, princes, warriors, and other high standing people of the Aztec society, was a symbol of one’s status, wealth, influence, and standing in society. 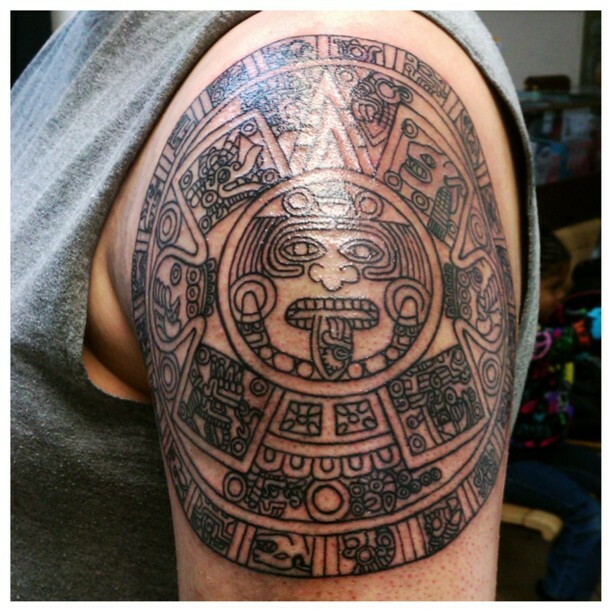 A half sleeve Aztec tattoo of the Aztec calendar with additional Aztec tattoo design elements with art deco influences. 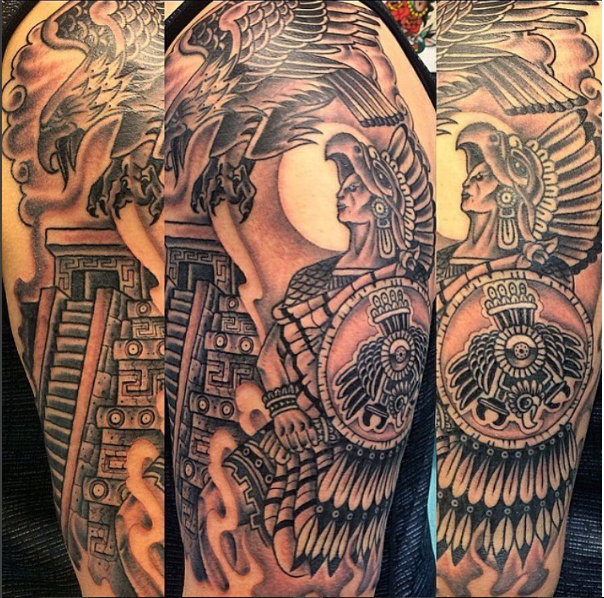 A traditional Aztec tattoo of an eagle on the sleeves. 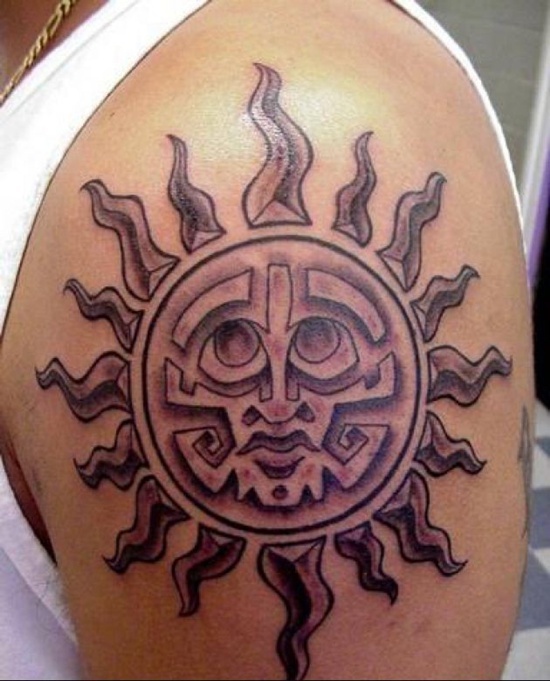 As time progresses and the once strong and mighty Aztec Empire fell to the Spaniards, the symbolic function of the tattoo slowly faded into oblivion. 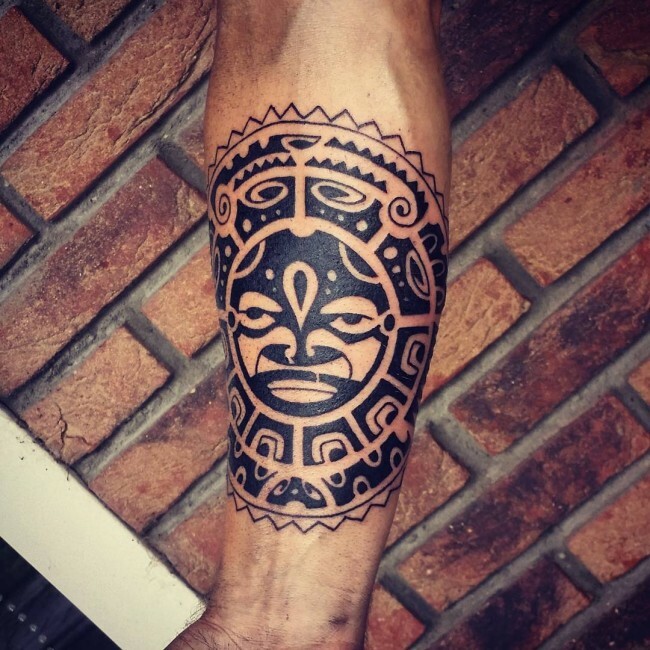 Although the tattoo design’s function is gone, it is rebirthed through another purpose, as a form of personal expression and at this day and age, we are absolutely sure that the Aztec tattoo design is slowly rising again. An Aztec tattoo on the arm of an Aztec female warrior. 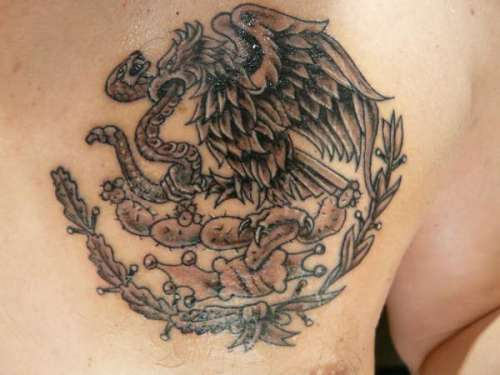 An Aztec tattoo of an eagle biting a snake while perched on a cactus which is tattooed on the chest. This particular imagery is the national symbol for Mexico. 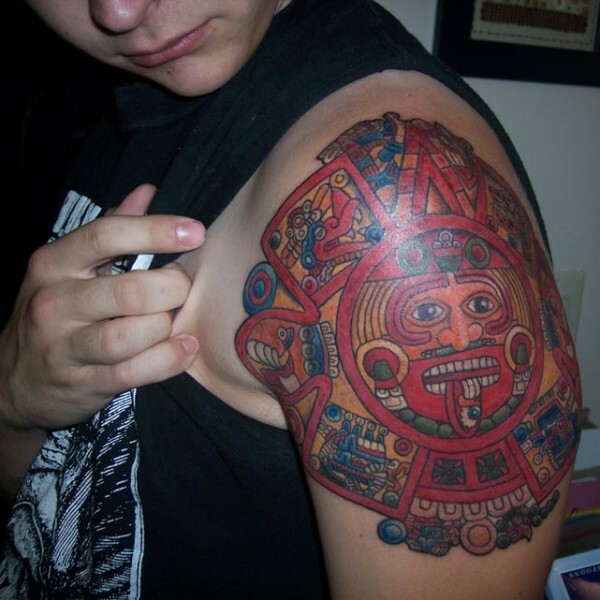 A colorful Aztec-themed tattoo on the shoulder. What Sort of Tattoos Should Men Avoid? For one, we are talking about “Tattoo Ideas For MEN” so comic book characters are out the question. You are a man and men do not have superhero tattoos on their skin. It makes them look like a little boy. Another tattoo design that has a notoriety in the tattoo community are iconic tattoos or tattoo designs that features famous people. 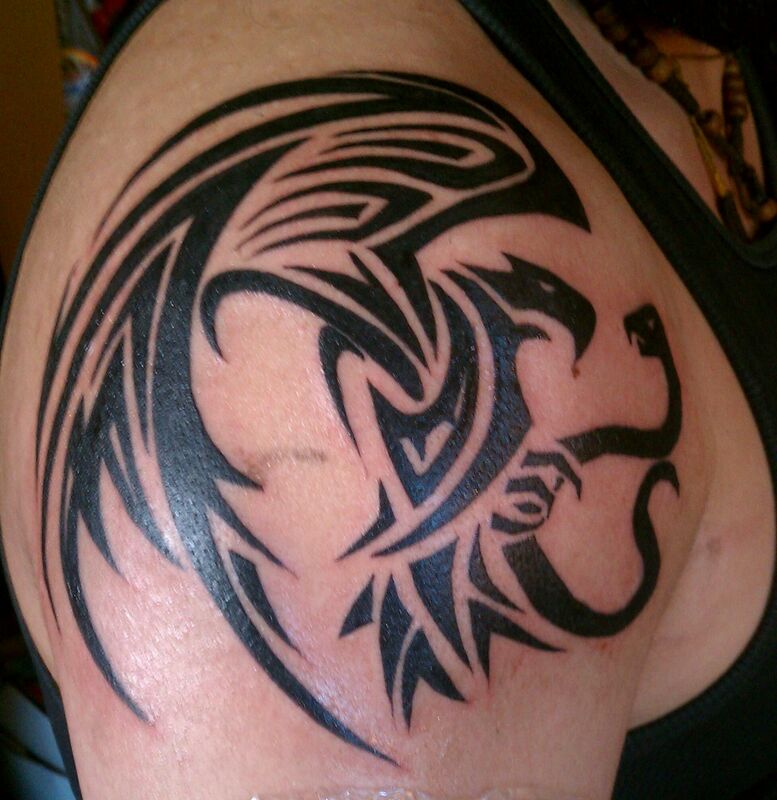 You are a tattoo enthusiast who wants to express their personality and traits. Having a Bob Marley, Elvis Presley, and other famous people on your skin will be detrimental to the image and personality you want to portray as. This one is a real doozy but is something worth to be said. 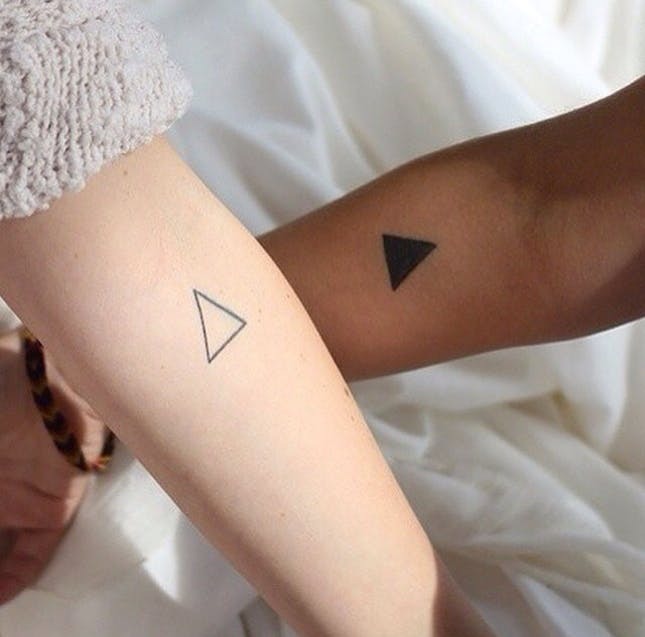 Having your partner’s names tattooed on your skin is a BIG NO NO! Do you even realize that you have to tattoo your loveydub’s name on your skin to express your love? No! If your love for the person is genuine and true, you will never ever need to express it in tattoo form because your lovely expressions to her are already enough. And what if you break up with her? what will you do with the tattoo then? You will regret this we are absolutely sure. We are actually quite surprised that you will still ask this one. Well, there are a lot of tattoo ideas for men out there and each tattoo design will require a specific set of places where you can place these tattoo designs on your skin. For simplicity’s sake, however, the usual places where men have their tattoos inked are on the chest, back, sleeves, arms, and legs area of the body. These are common places in hosting tattoo ideas for men. Arm tattoos or forearm tattoos in some regions of the world is considered to be the most popular tattoo when it comes to body placement. The skin on the arm is far from the bone which will lessen the pain when the needle inks a tattoo design on the skin. Because of this, most beginners and novices of the tattoo community will almost always have their first tattoo on this body part, hence its popularity. Here are a few arm tattoos that you may like. 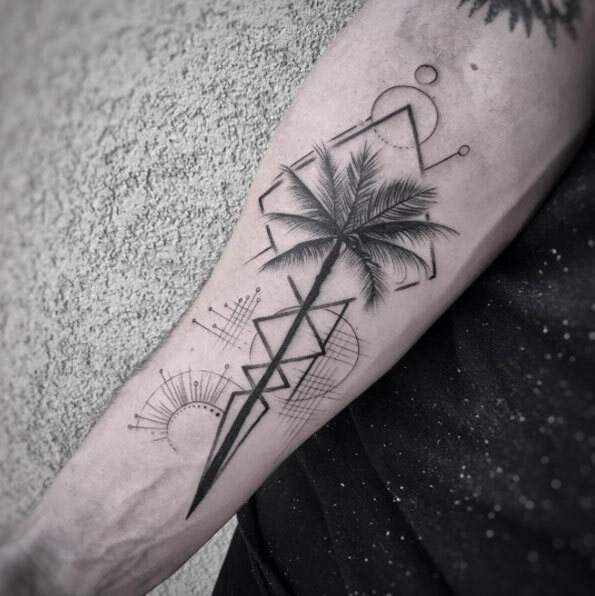 An artsy arm tattoo of a palm tree. 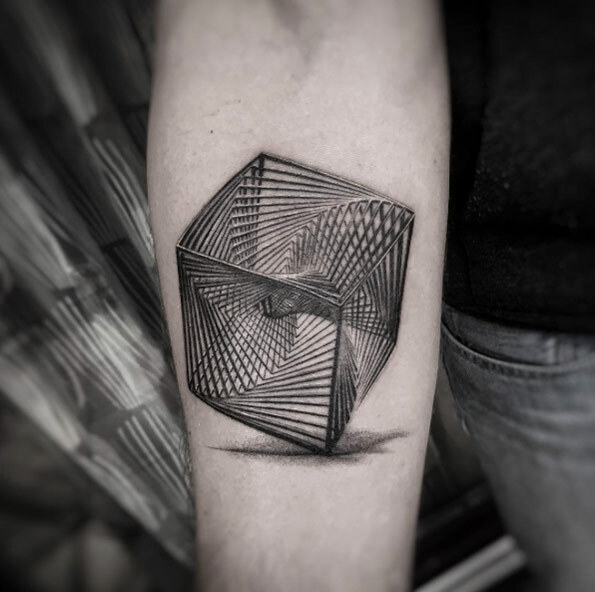 An arm tattoo of a weird three dimensional geometric figure. 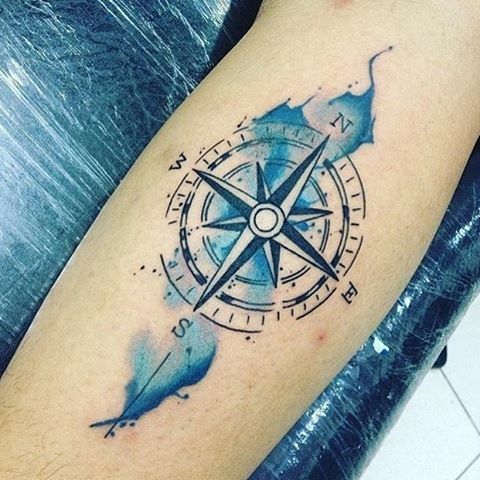 A highly detailed arm tattoo of a compass. 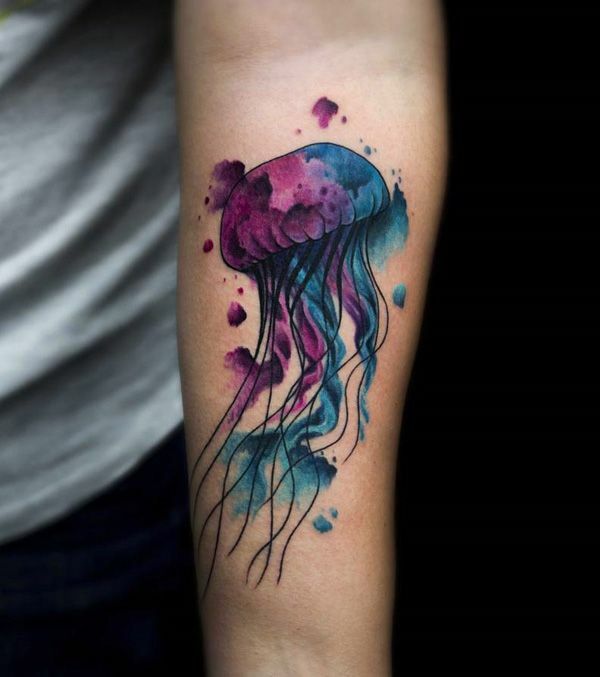 A colorful and vibrant jellyfish arm tattoo. 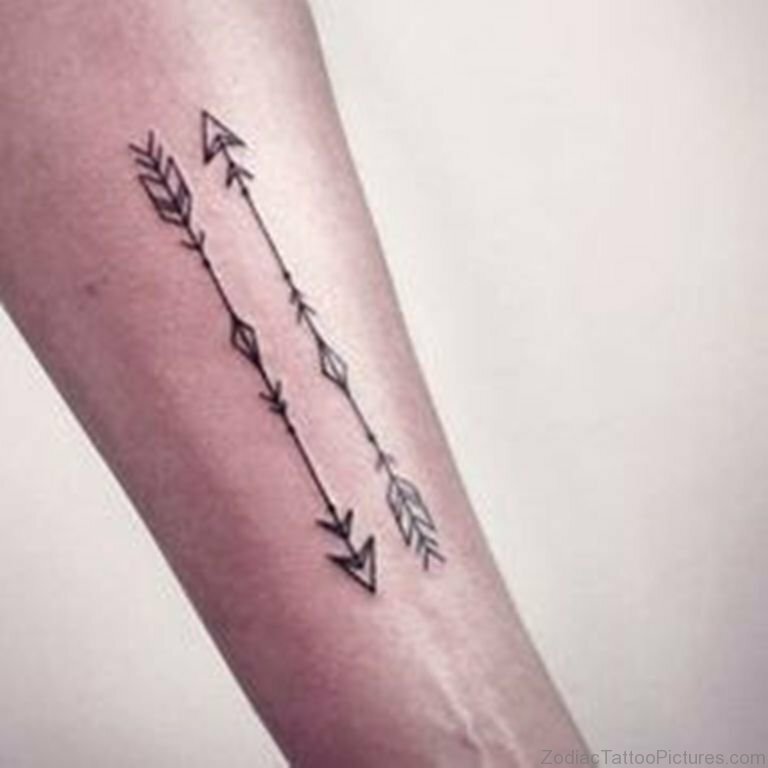 An artsy arm tattoo of two arrows. This tattoo by placement is considered to be the most popular for women but because men are now leaning more to unisexual designs, men are now catching up for this tattoo placement. Basically speaking, wrist tattoos are tattoos inked on the wrist, it may extend to the forearm but usual wrist tattoos are just small because of the pain the wearer needs to go through when having a wrist tattoo. You see, wrist tattoos are one of the most painful tattoos out there because the skin is touching the bone. A stroke of the needle will automatically be felt by the bone underneath. No matter, if you think you can rock this one out, go ahead and have one! 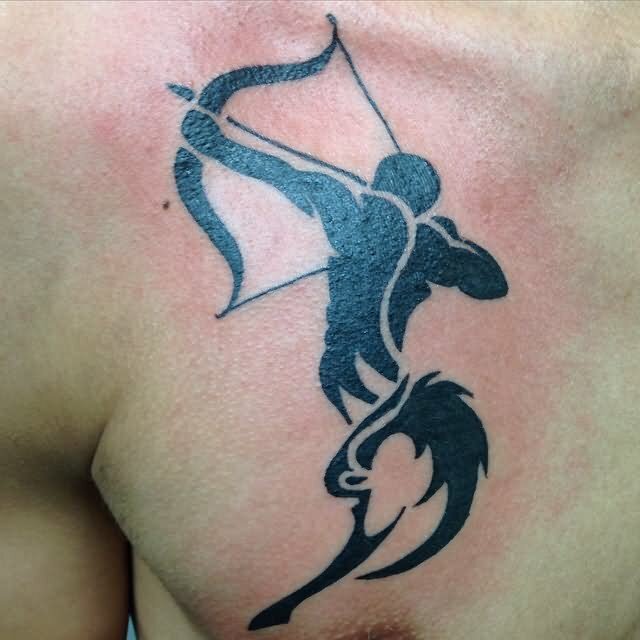 A wrist tattoo of an artsy bow and arrow. 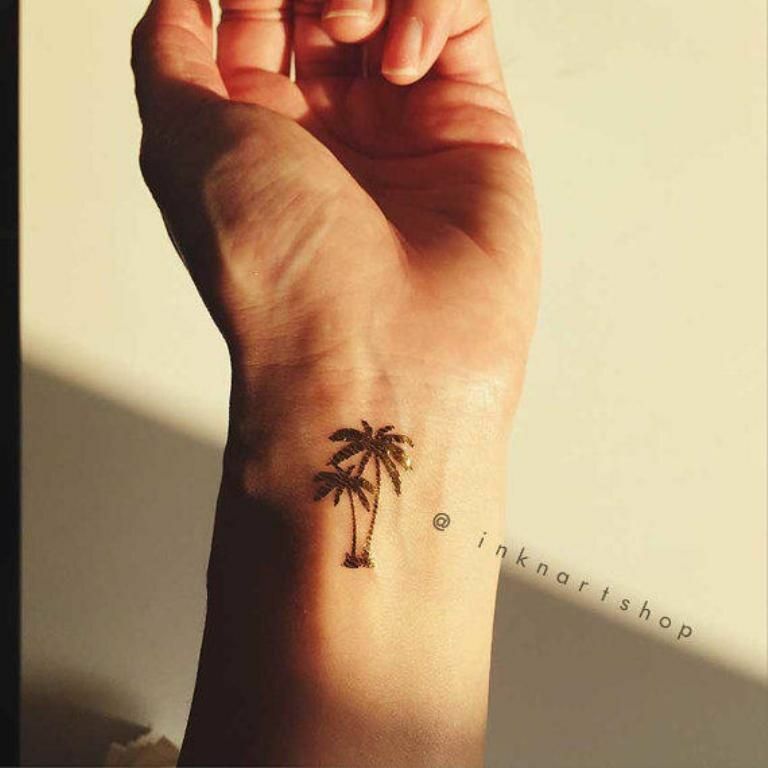 A small palm tree tattoo on the wrist. A wrist tattoo of a tribal patterned bracelet. 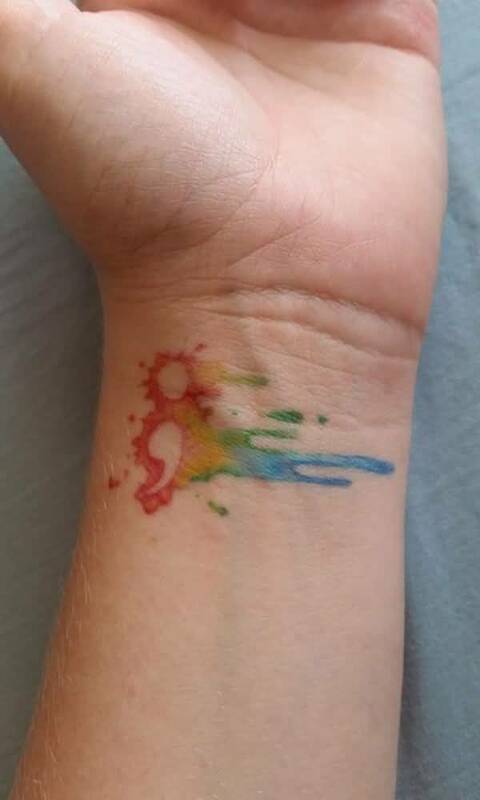 A colorful watercolor wrist tattoo of a semicolon. 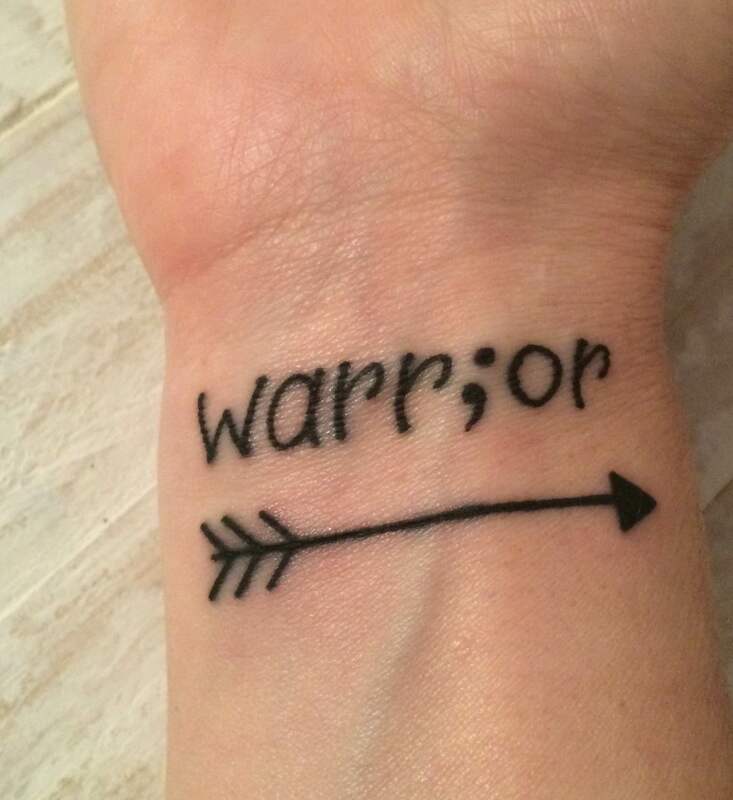 A wrist tattoo of the word warrior with an arrow. Full sleeve tattoos are considered the holy grail of men in the tattoo community. They hold having a sleeve as the highest honor a man can have because of the pain they will go through when having this tattoo inked on their skin. Most full sleeve tattoos are intricately designed with a high level of detail since we are talking about full sleeve tattoos. 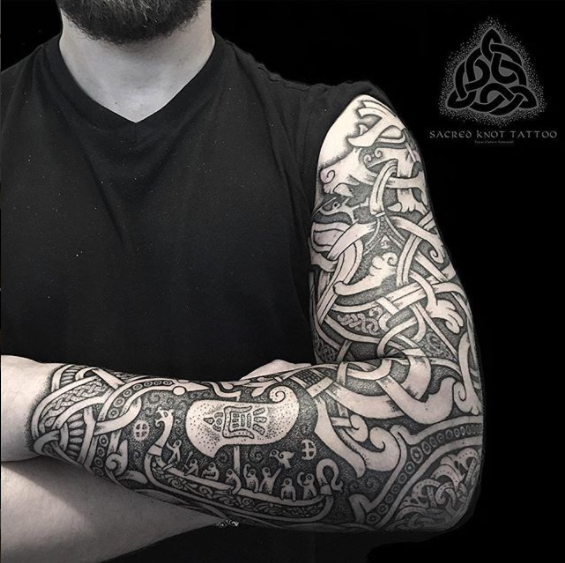 A full sleeve tattoo of a traditional Celtic pattern. 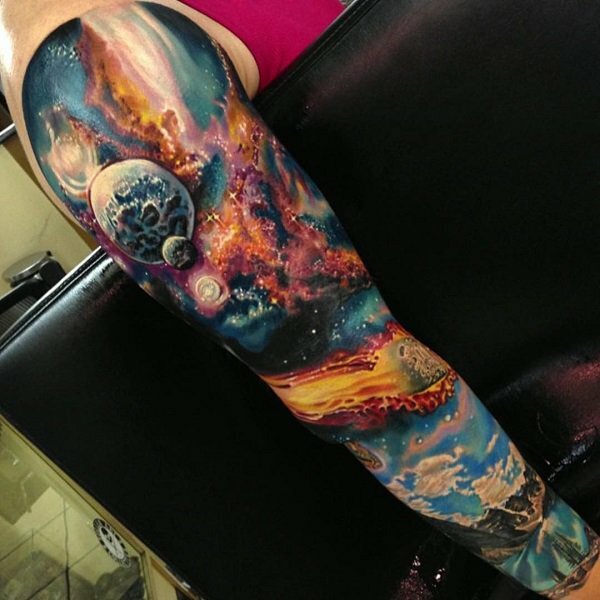 A colorful and highly detailed full sleeve tattoo of the cosmos. 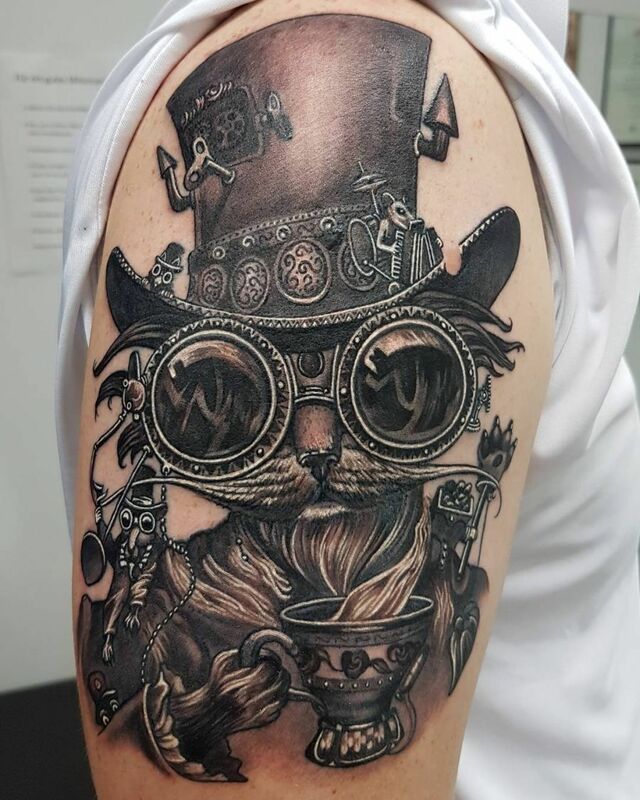 A steampunk-themed full sleeve tattoo. A Viking-themed full sleeve tattoo. A full sleeve tattoo of an intricately designed Native American warrior. Half sleeve tattoos also hold the same respect as that of full sleeve tattoos because it is only a smaller version of the tattoo mentioned above. This tattoo is also designed intricately with a high amount of detail to realize this tattoo to its full potential. 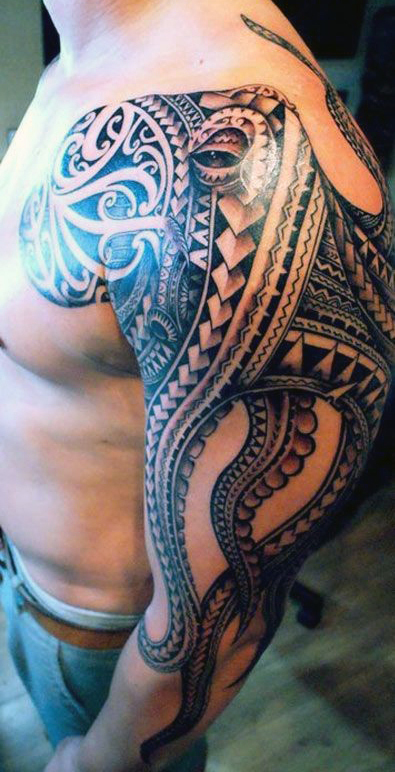 A sleeve tattoo of a Polynesian tribal pattern. 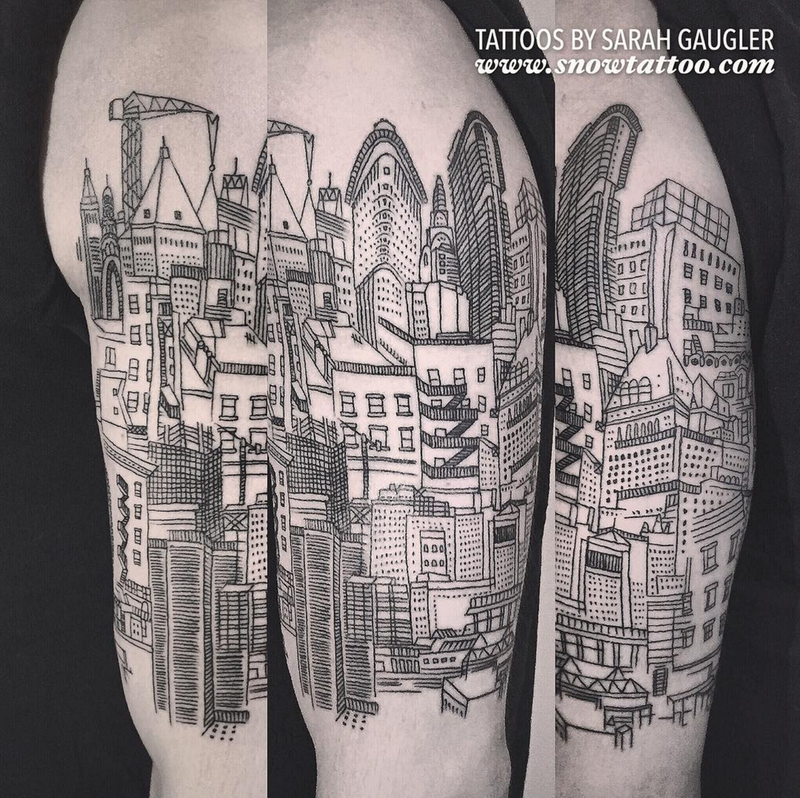 An intricate sleeve tattoo of a typical cityscape. A beautiful sleeve tattoo of the Brooklyn Bridge. 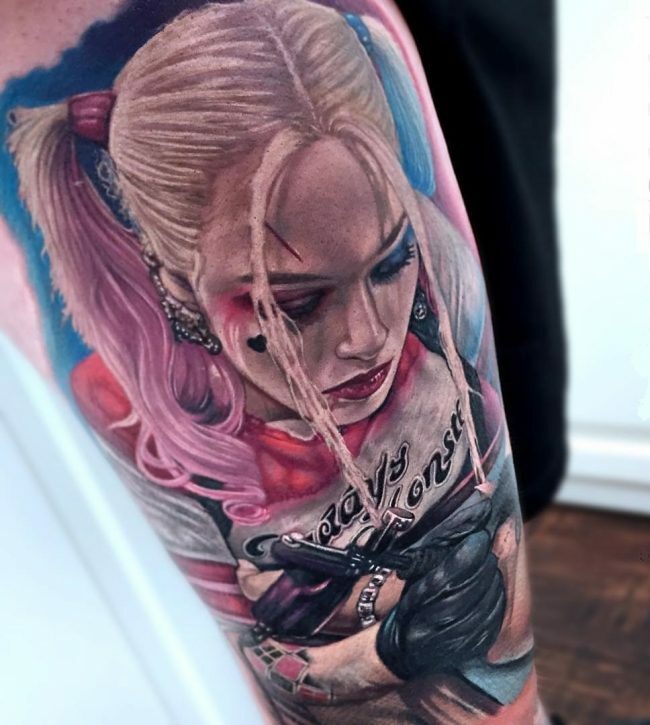 A colorful and vibrant sleeve tattoo of Harley Quinn. 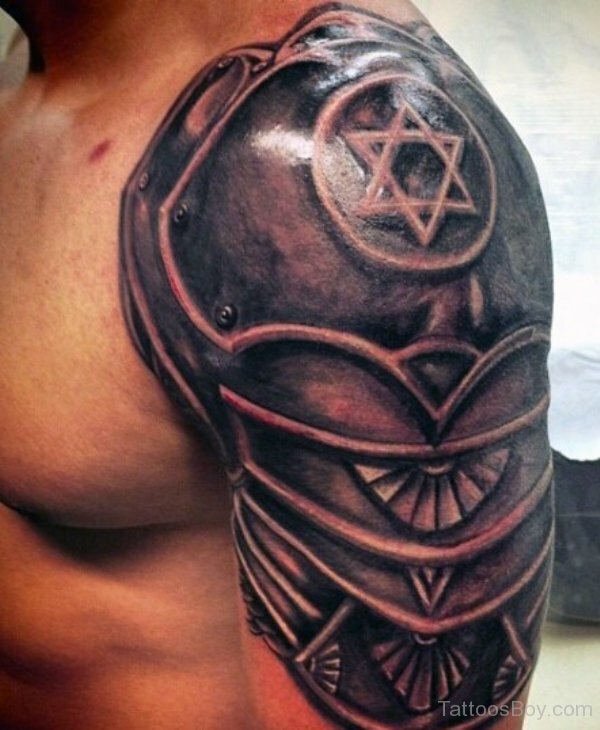 An arm plate armor piece sleeve tattoo. Shoulder tattoos are not famous but it is currently gaining traction because of the uniqueness it brings to the entire tattoo design. Usually, the shoulders are just used when a chest or sleeve tattoo is large and needs extra space but now, more and more tattoo artists and tattoo enthusiast like to have the shoulders to host a separate tattoo on its own. 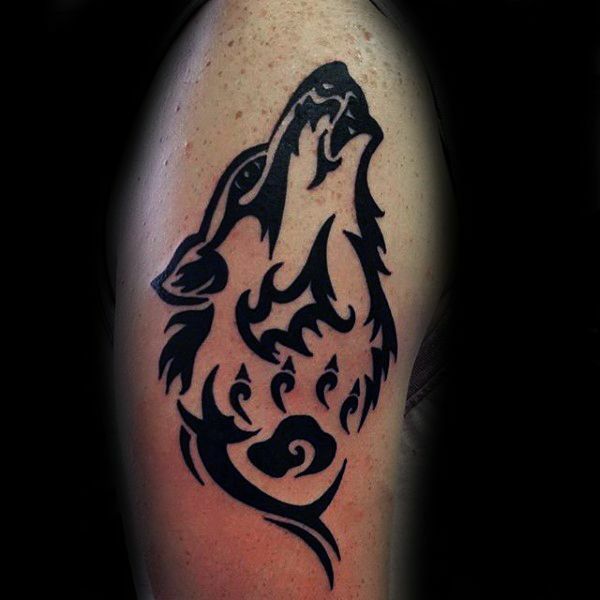 A shoulder tattoo of a tribal wolf with Chinese influences. 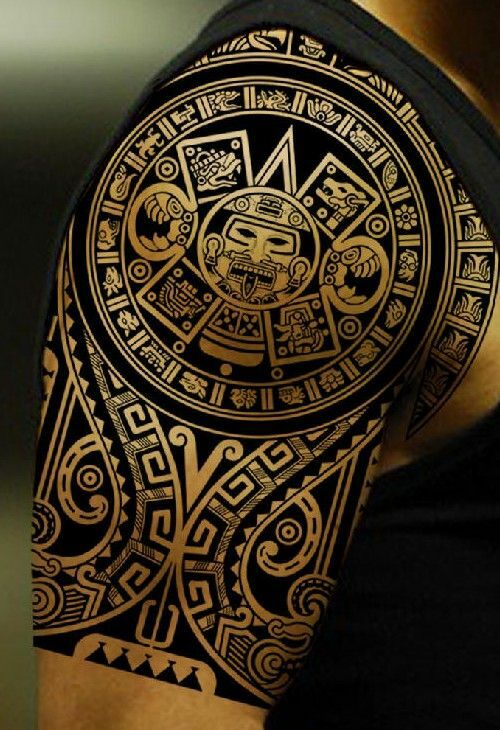 A large and intricate shoulder tattoo of an Aztec calendar. 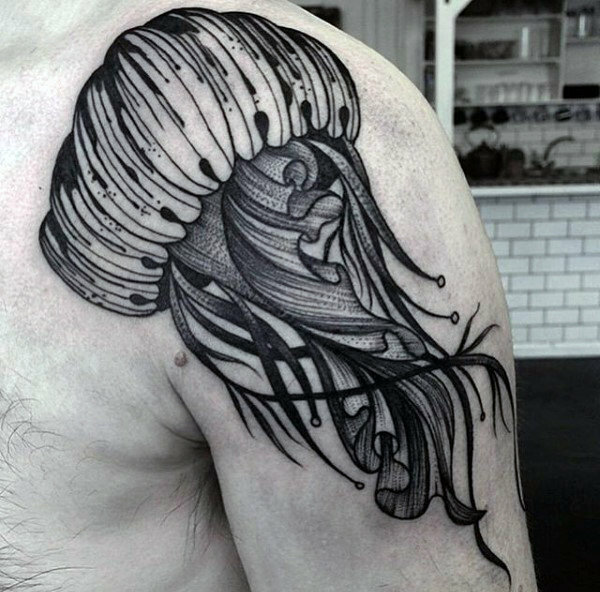 A shoulder tattoo of a jellyfish. 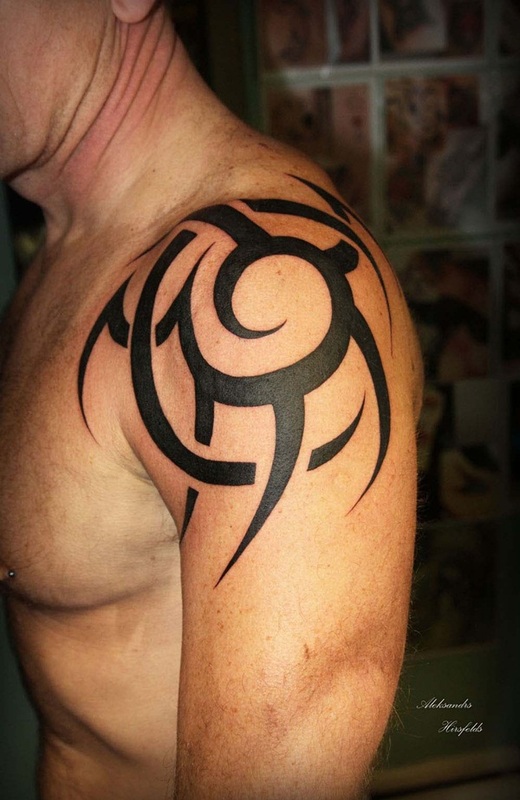 A shoulder tattoo of a swirling tribal pattern. 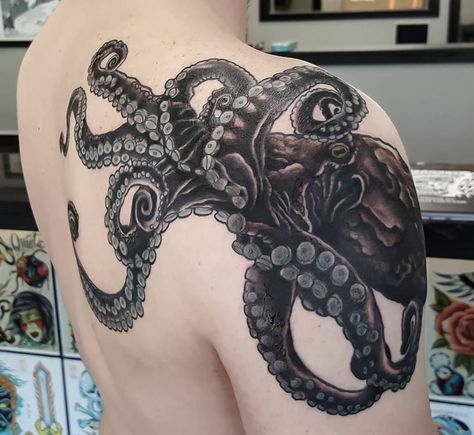 A shoulder tattoo of an octopus that extends to the back. Chest tattoos are tattoos inked on the chestal area of the body. 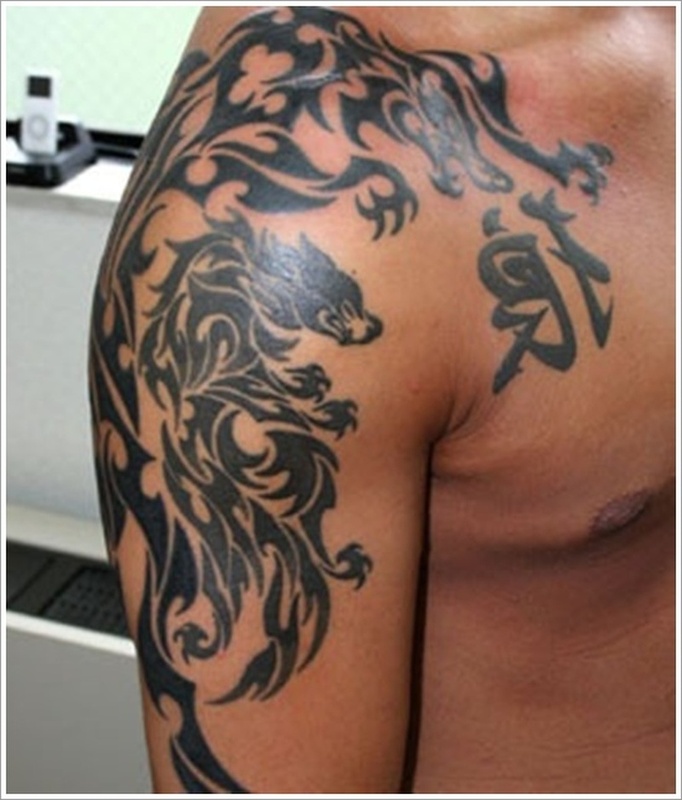 This tattoo placement is most famous for men who need to have a flat surface to host a tattoo design. This tattoo placement is most often used for very intricate designs that will not work with other tattoo placements. 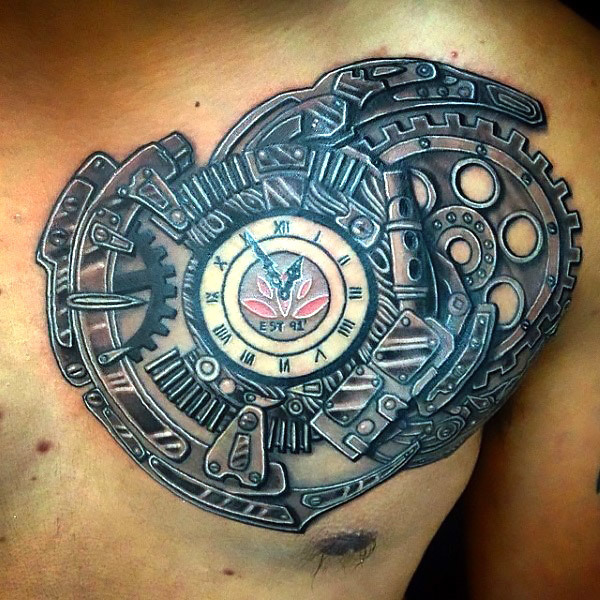 A steampunk chest tattoo of a clock. 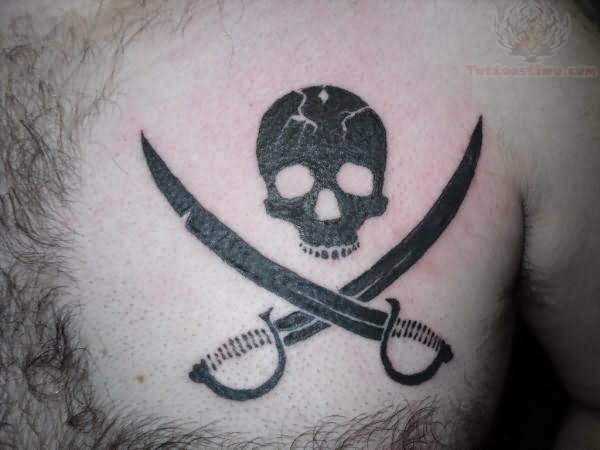 A chest tattoo of the Jolly Roger. 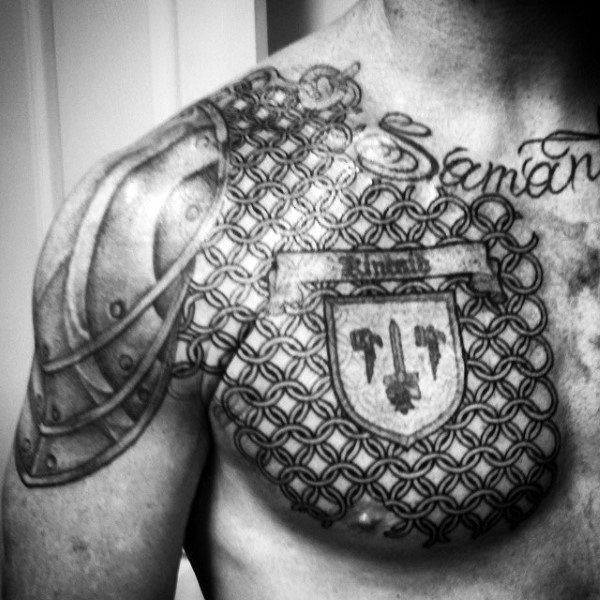 An armor tattoo on the chest of a chainmail chest armor piece. 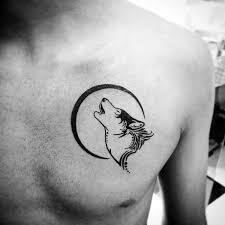 A chest tattoo of a wolf howling to a moon. 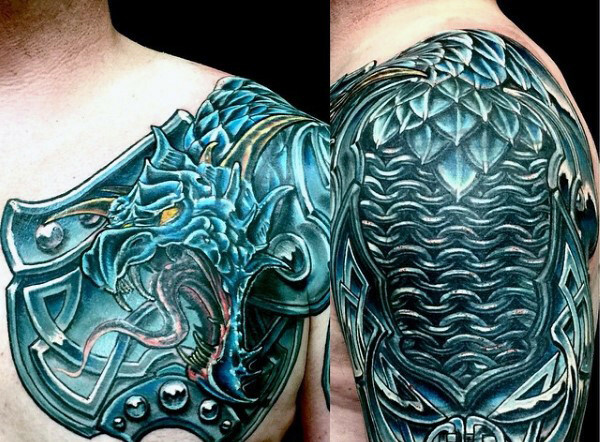 A colored and highly intricate chest tattoo of a shoulder plate with chest piece armor piece. Here are some of the neck tattoos we saw on the internet. A colorful and intricate neck tattoo of an owl. 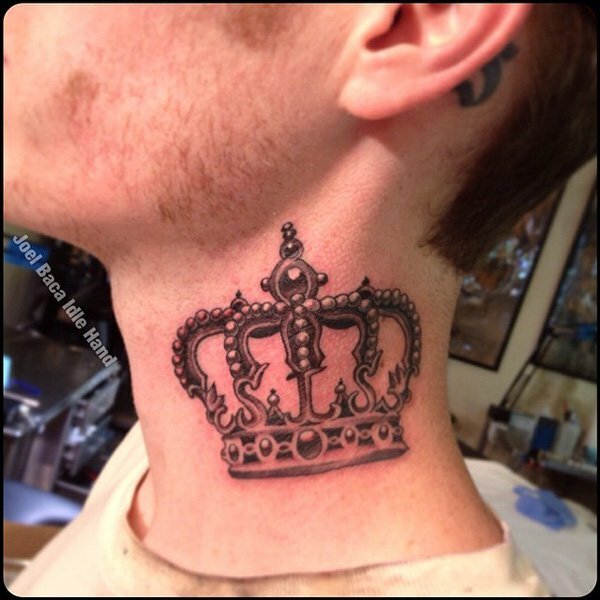 A neck tattoo of an imperial crown. 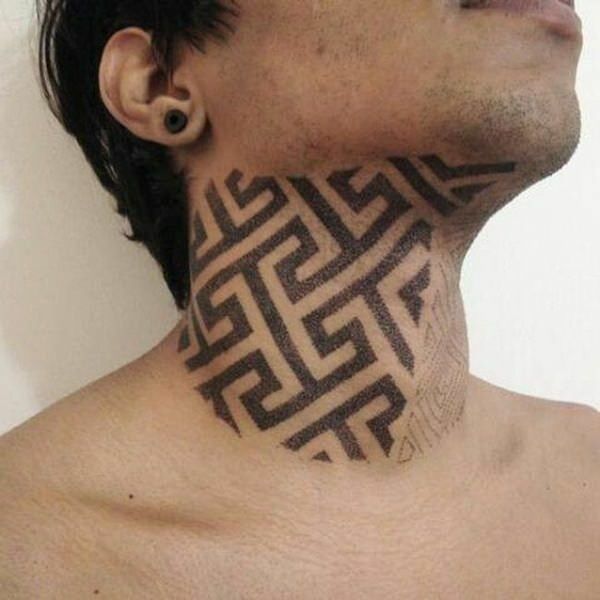 An interesting neck tattoo of a maze-like pattern that extends to the lower chin and jaw bone. 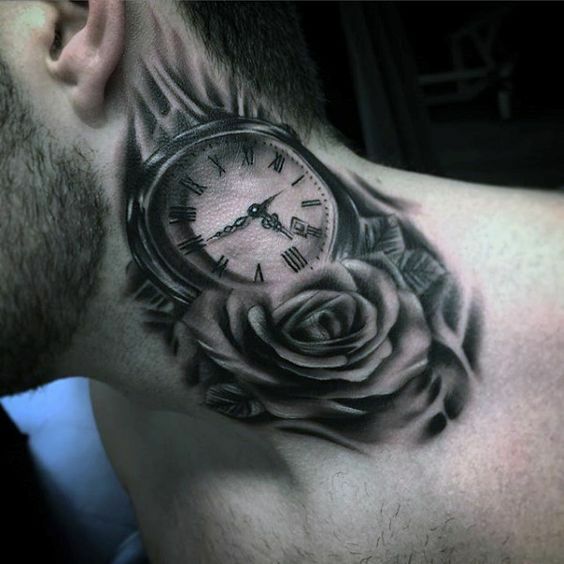 An intricate tattoo of a clock and a rose on the side of the neck. 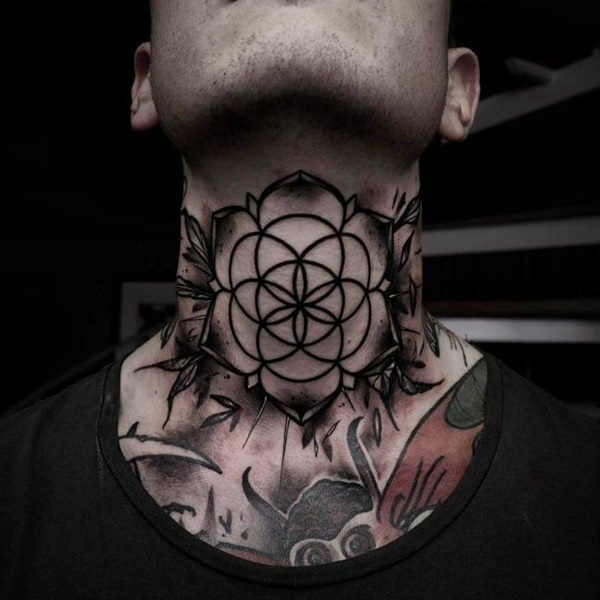 A neck tattoo of a mandala. Back tattoos are the largest and the most complex of all tattoo placements out there. 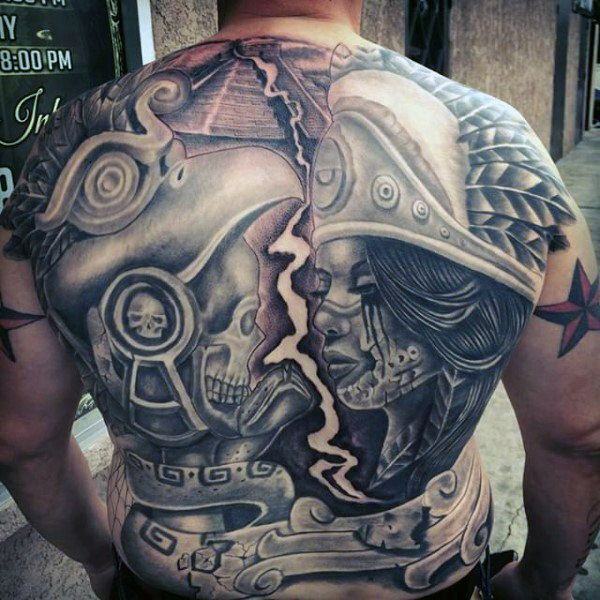 Because the back has the largest surface area in general, most tattoo designs that occupy the back are large, intricate, and highly detailed to take advantage of that sweet large skin space. This tattoo can be quite painful to be inked if the needle is on the middle part of the back since the spinal column is there but aside from that area, this tattoo placement can be quite tolerable when it comes to pain levels. A large upper back tattoo of the Jolly Roger. A full back tattoo of a native american female warrior. An upper back tattoo of a highly detailed octopus. 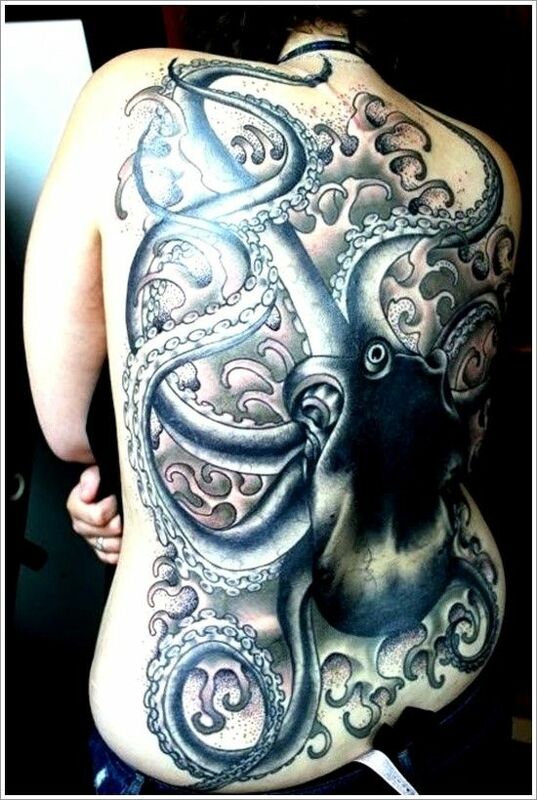 A large full back tattoo of an octopus. A large intricate and highly detailed full back tattoo of an oni mask. 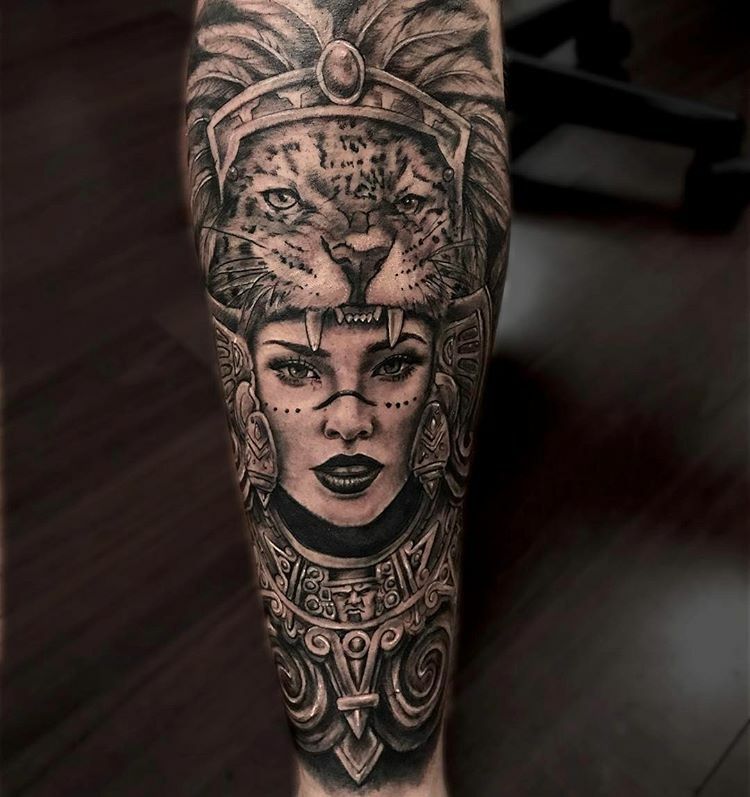 Leg tattoos share the same amount of popularity as that of arm or forearm tattoos. leg tattos are actually considered as a counterpart if the arm is not available for a tattoo. Since the legs have a a thick layer of muscle and fat underneath a reasonably thick skin, most novices and beginners of the industry would have their tattoos on this part of the body since the pain is more tolerable here and the tattoo can be hidden from view easily if need be. 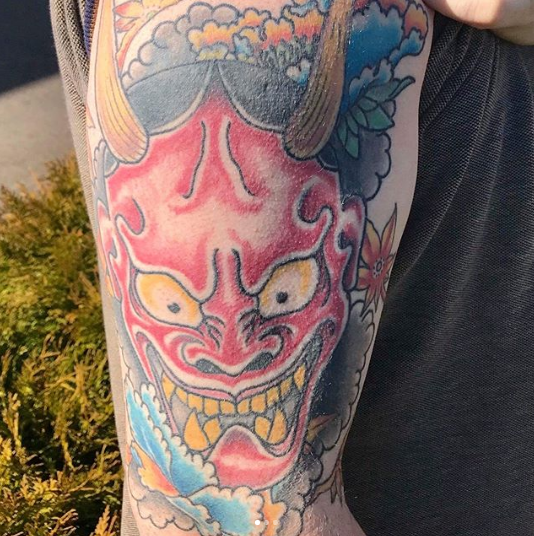 A colorful oni mask tattoo on the leg. 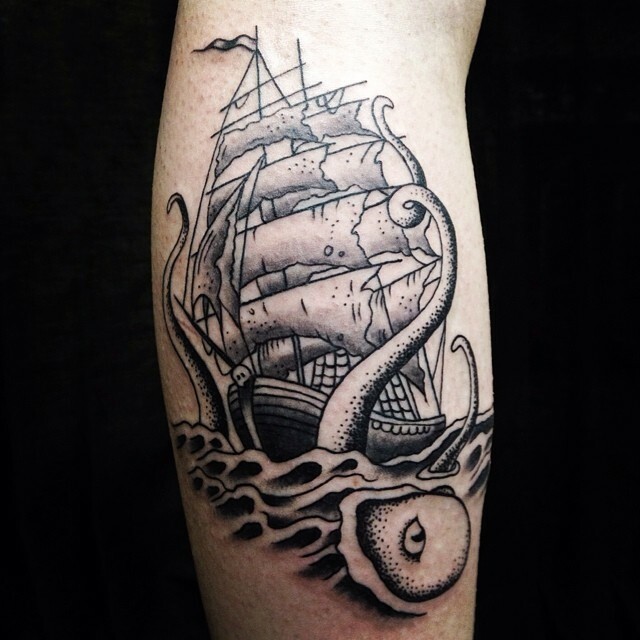 A black and white neotraditional leg tattoo of the Kraken consuming a ship. 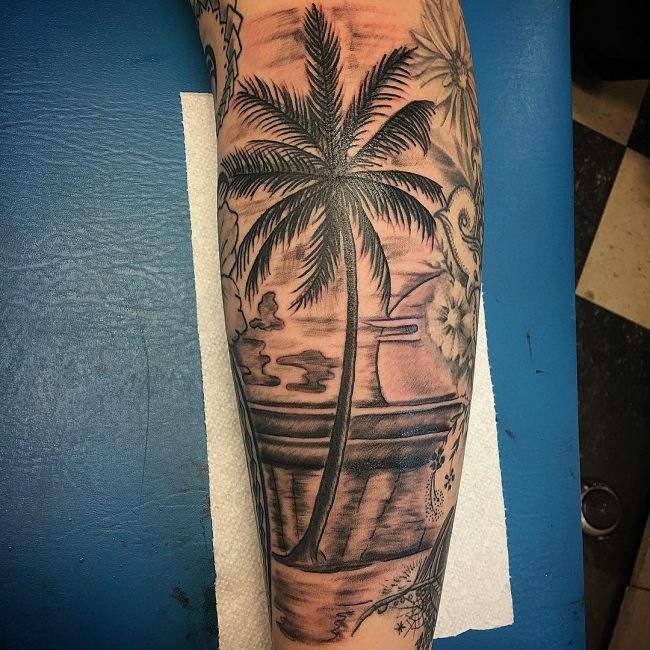 A large drawing like tattoo of a palm tree near the beach. 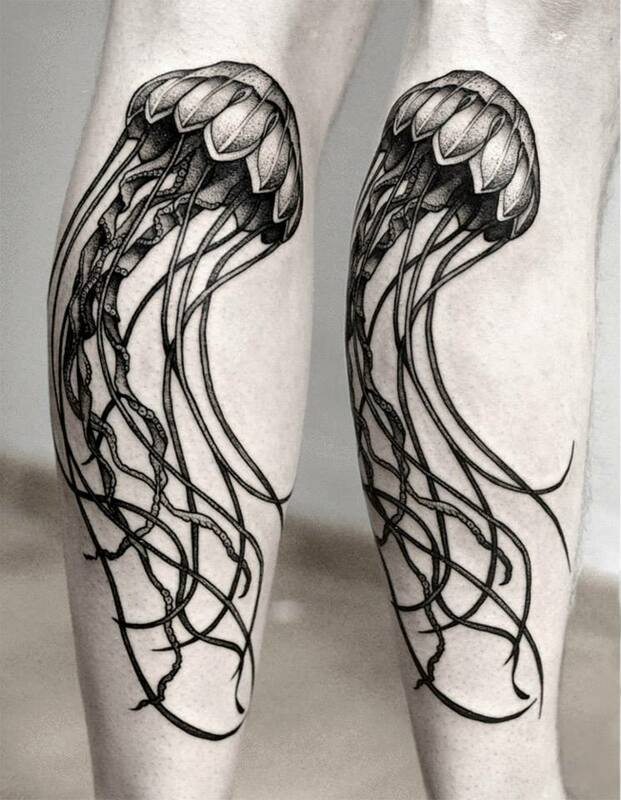 A large and intricate leg tattoo of a jellyfish. A neotraditional leg tattoo of the eye of horus. We do not advice to just go with these body parts because here at Tats N’ Rings, we advocate for self-creativity and we personally believe that you will know where to perfectly place the tattoo design you will want. You know your body better than we are so you will know where to place them.